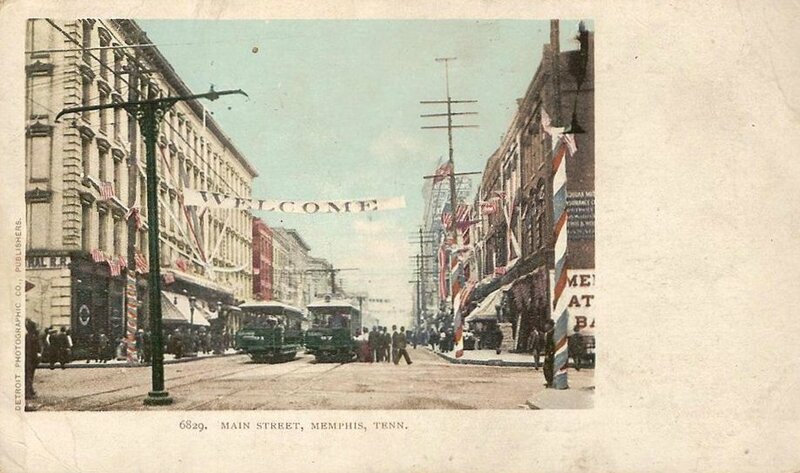 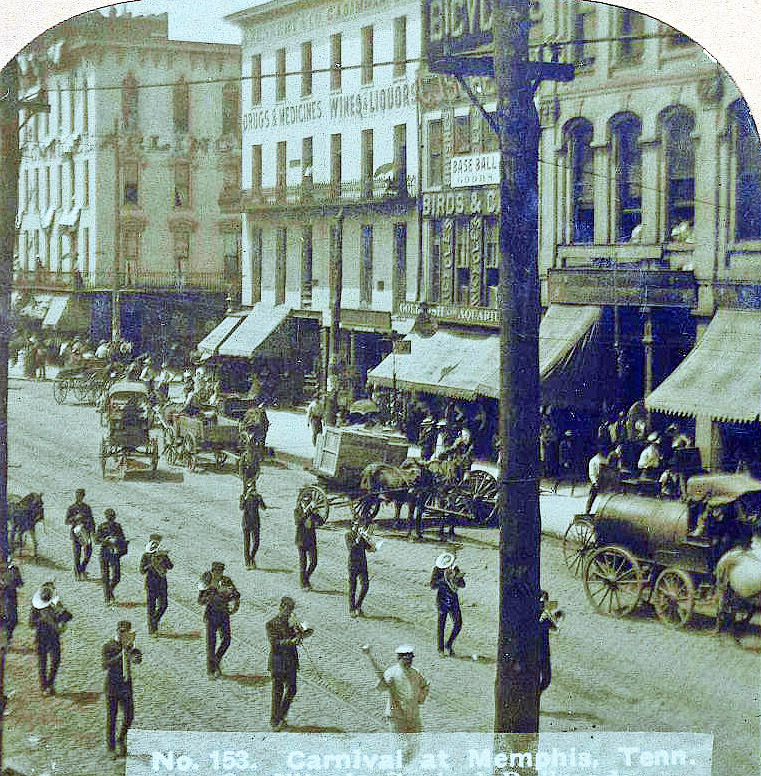 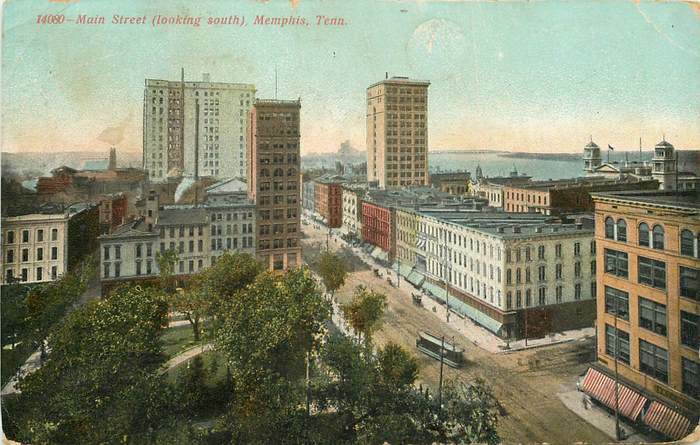 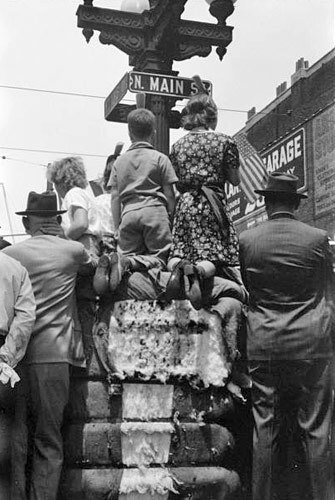 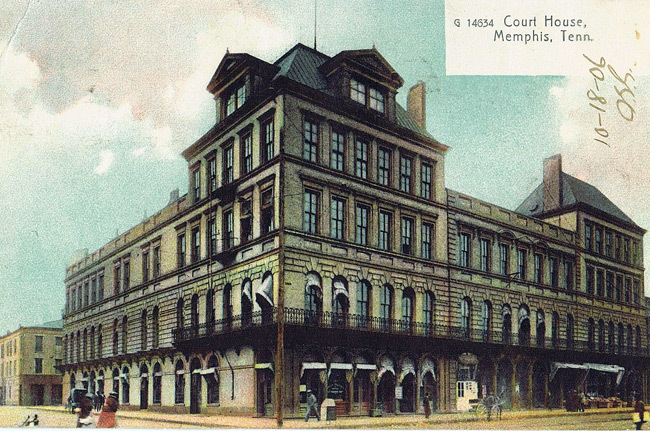 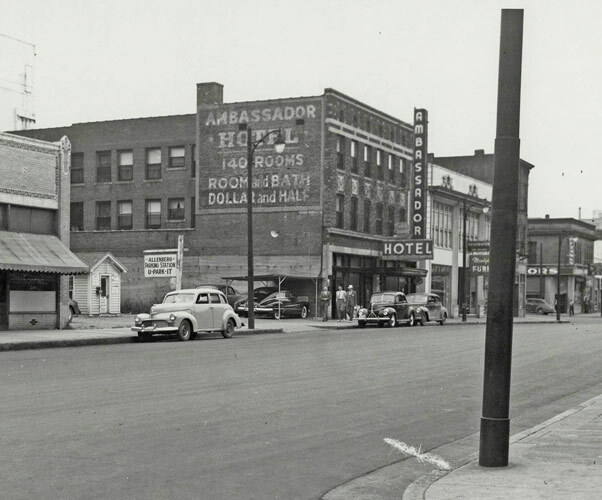 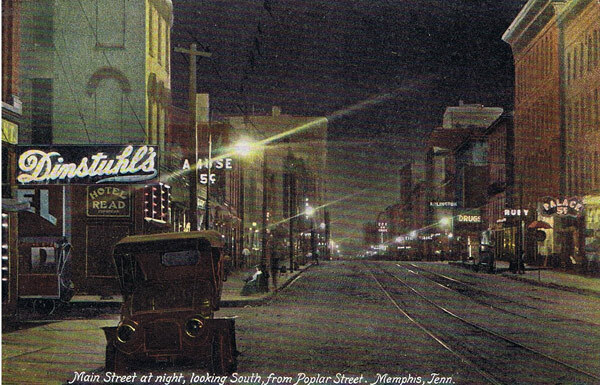 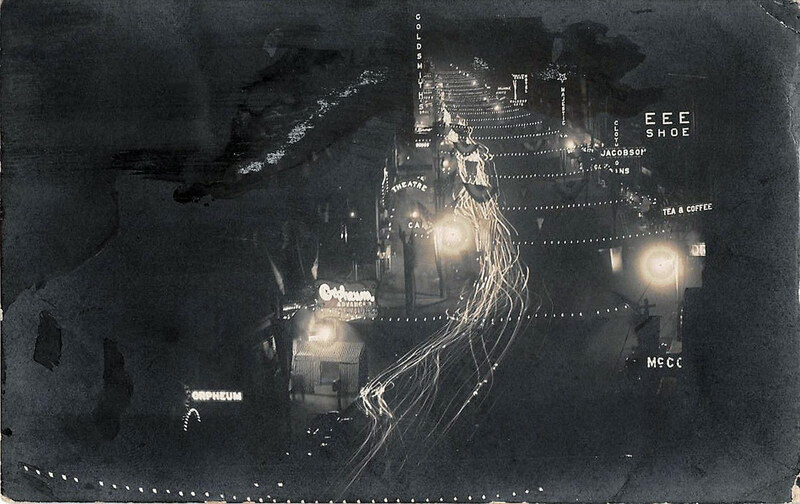 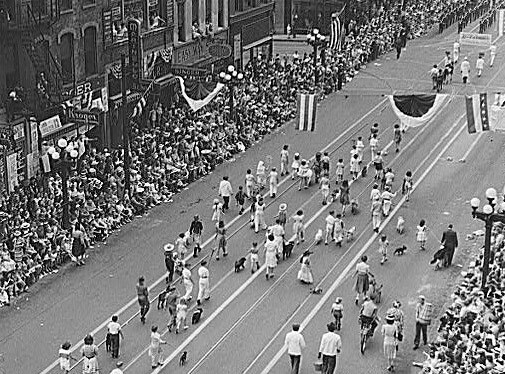 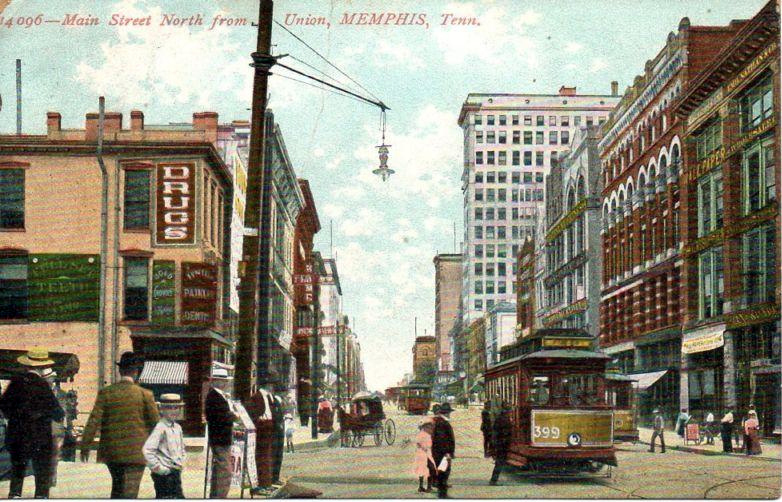 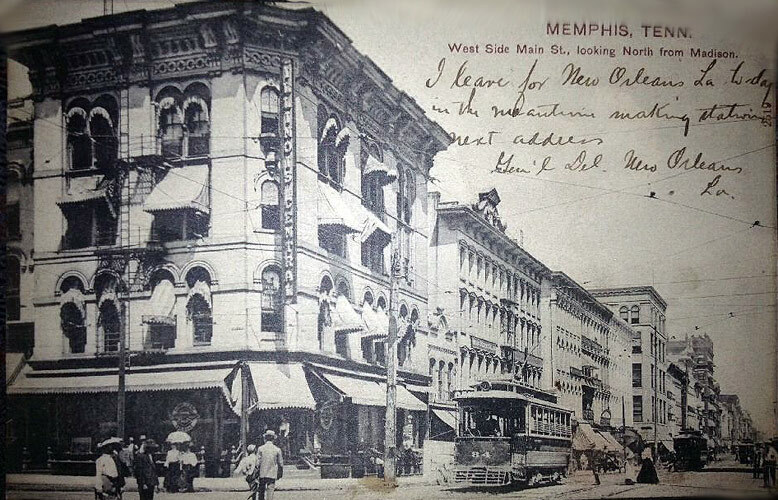 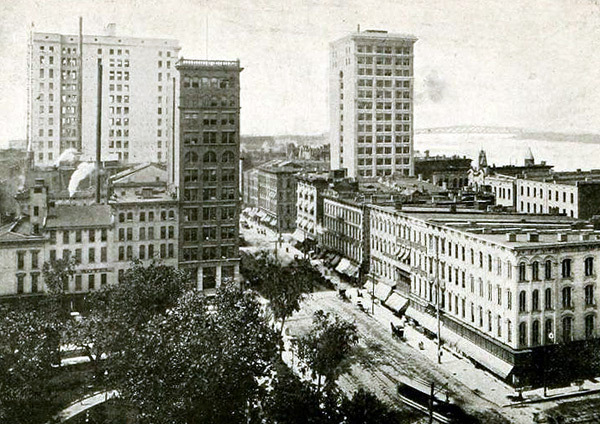 It wasn't long after the growing settlement on the bluffs above the Mississippi River was named Memphis, that Main Street began to represent its "heart and soul." 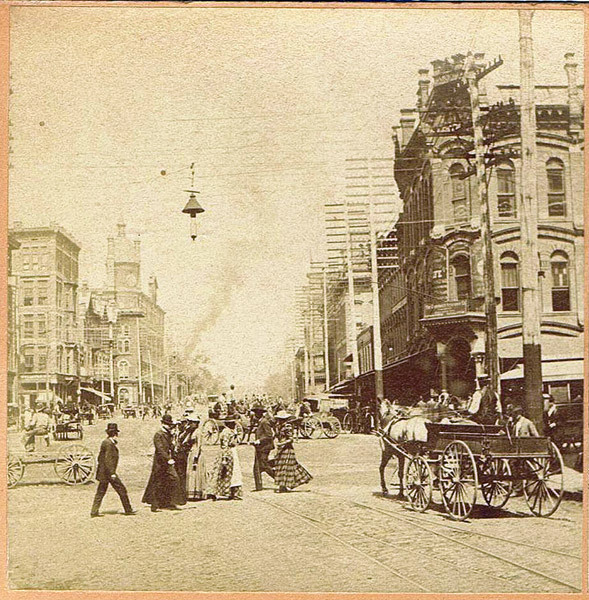 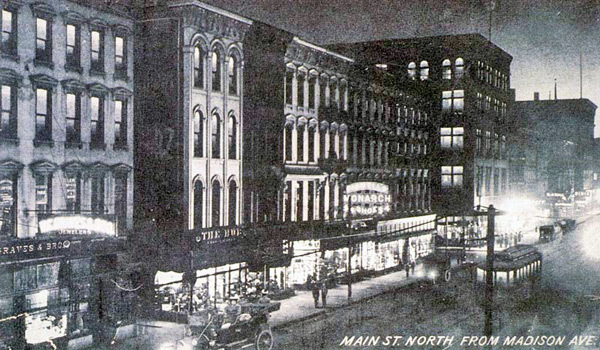 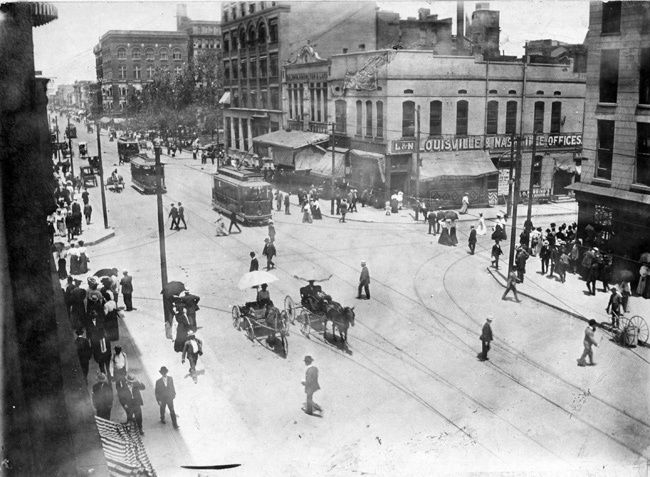 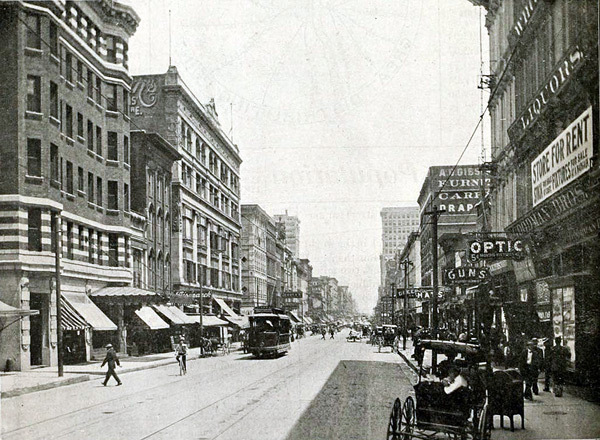 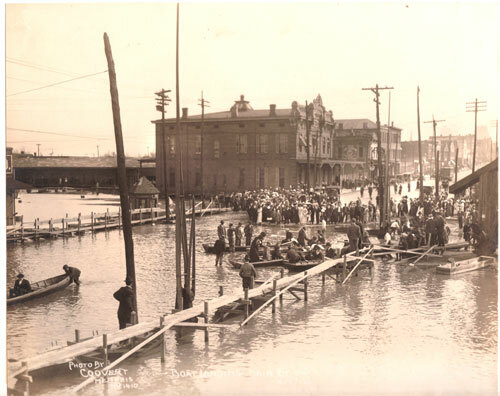 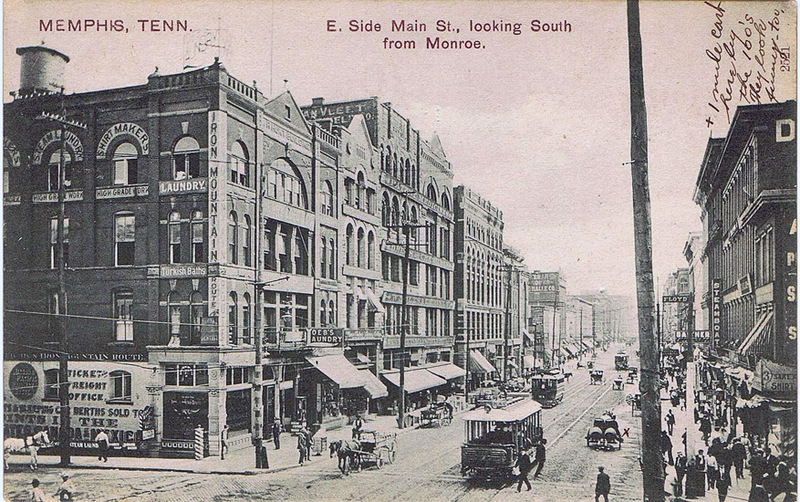 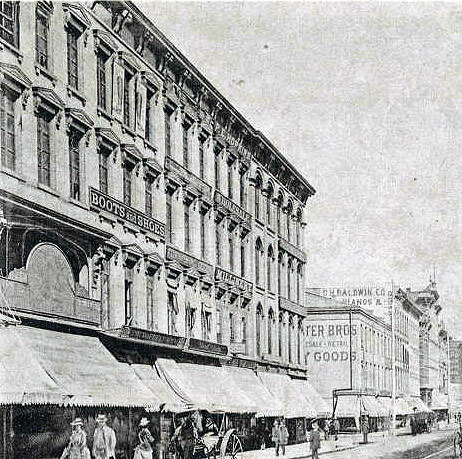 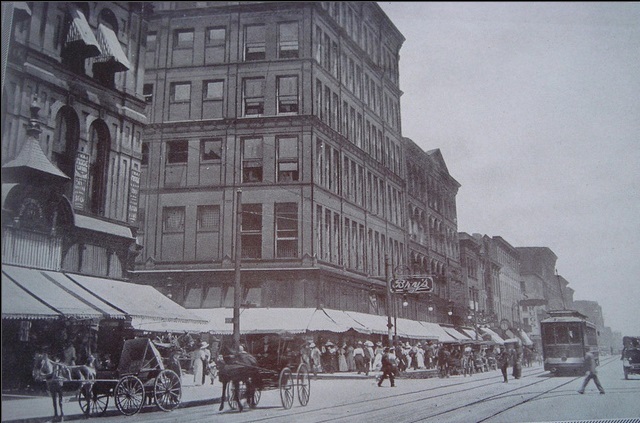 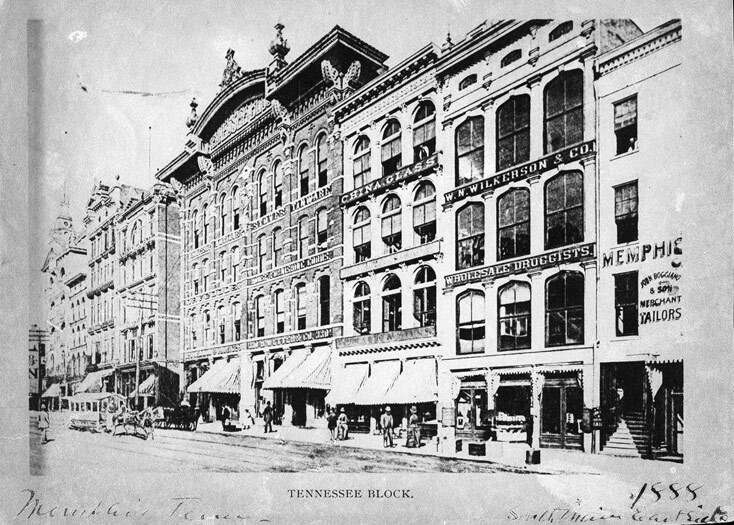 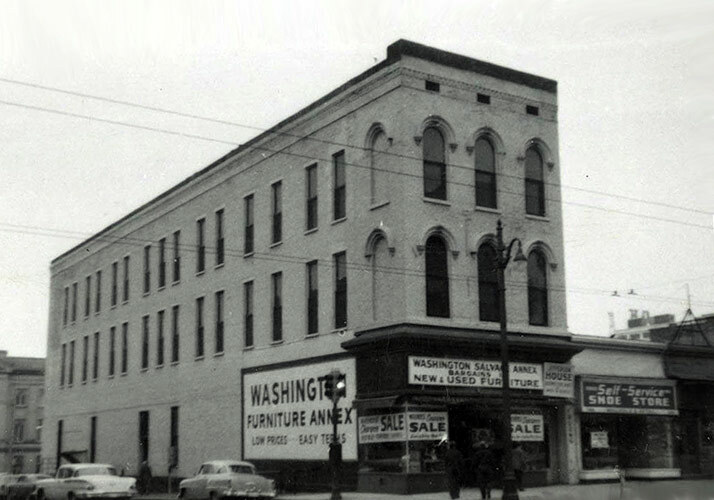 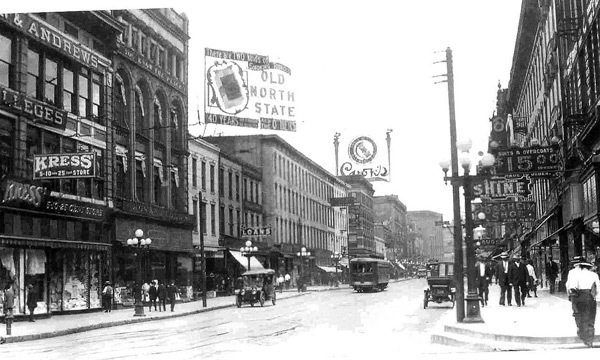 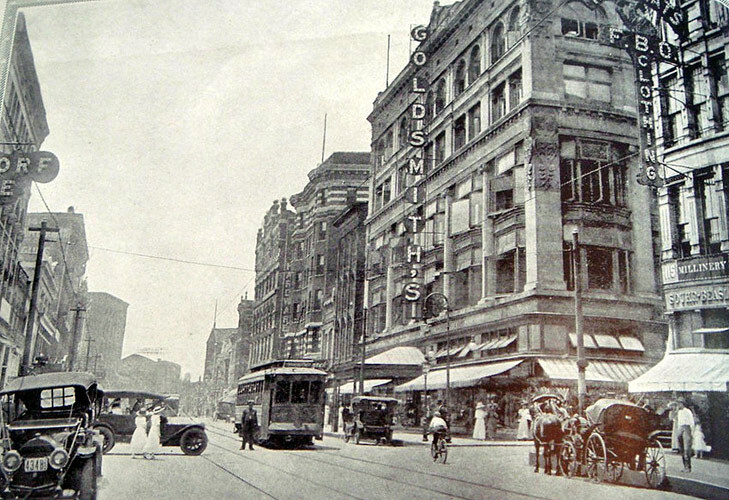 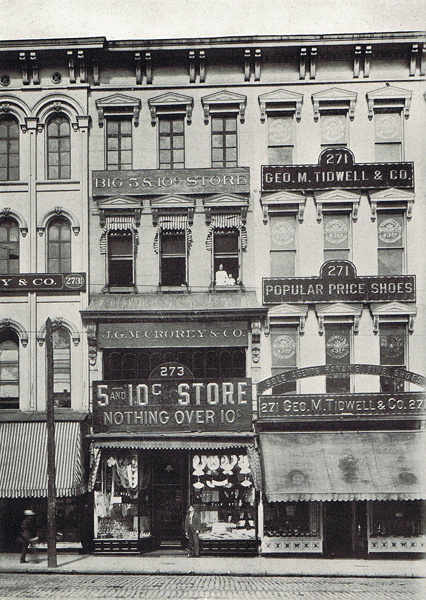 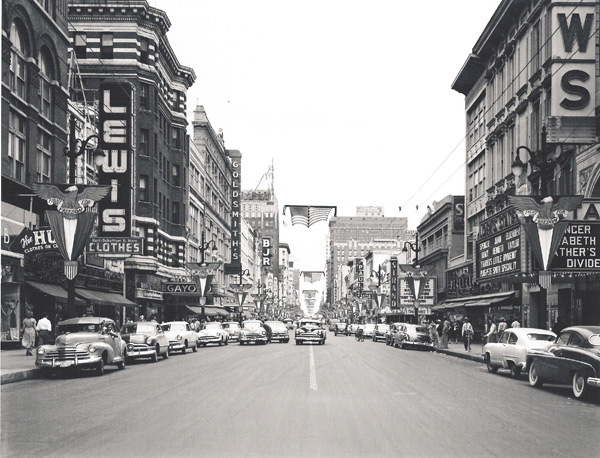 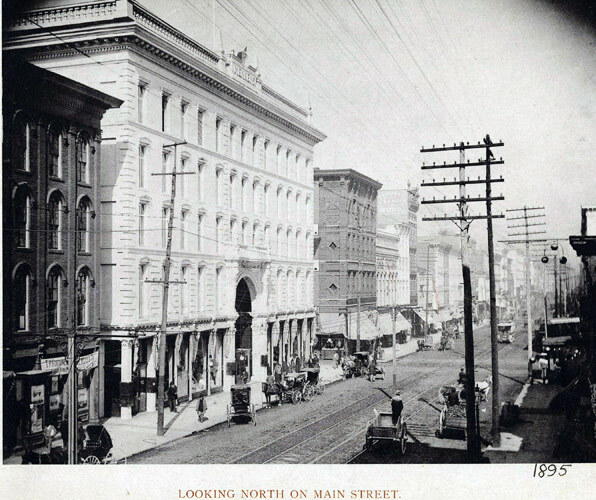 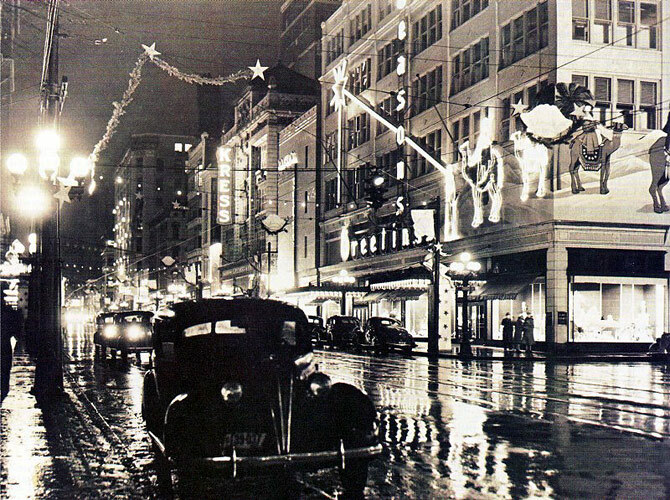 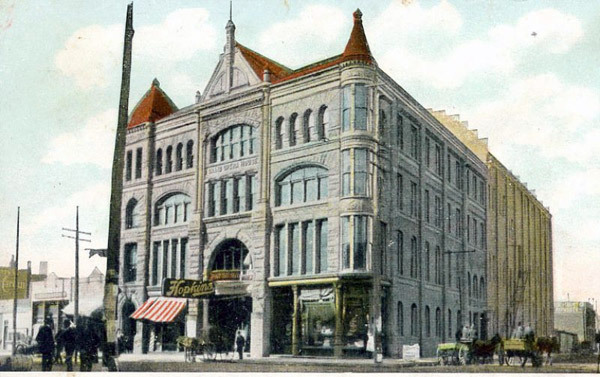 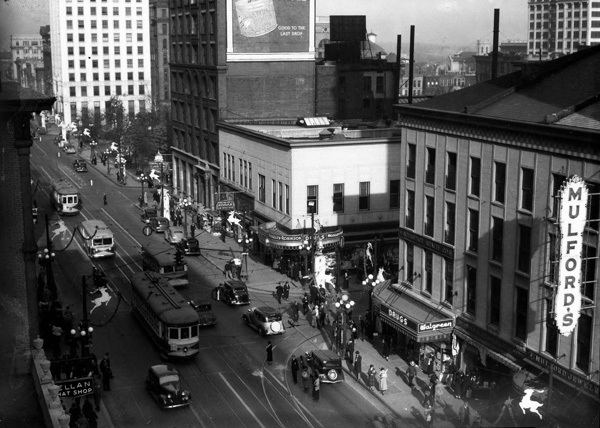 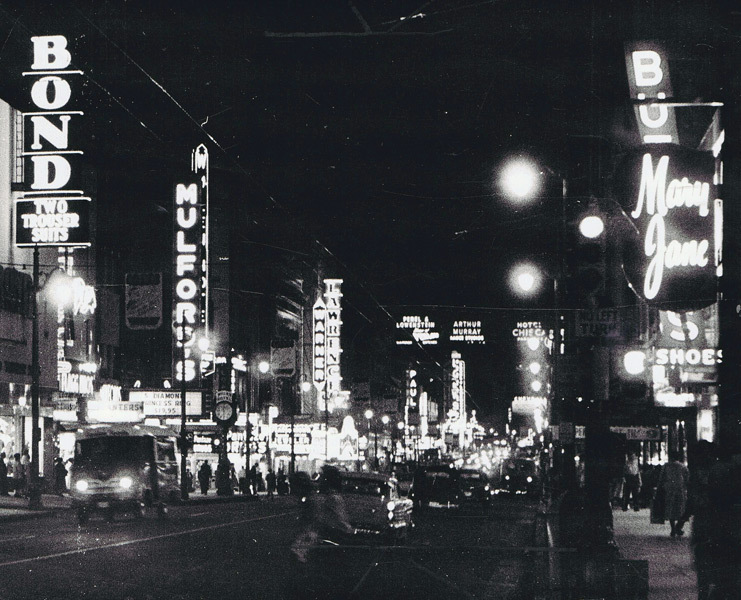 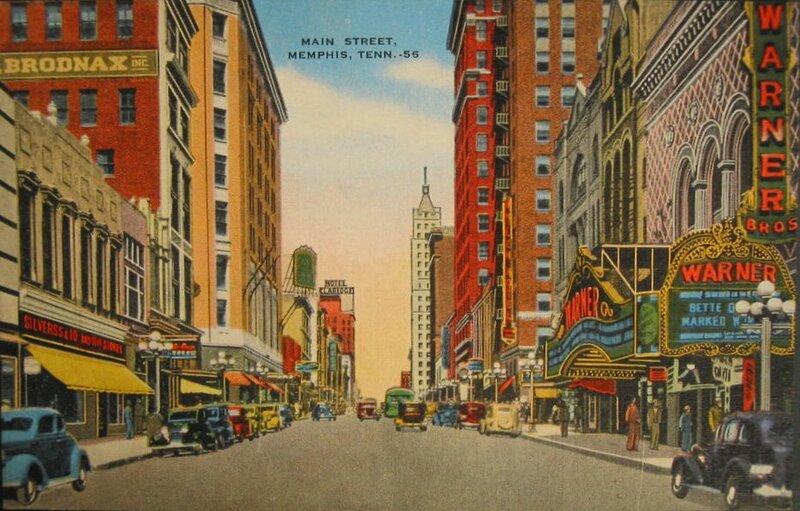 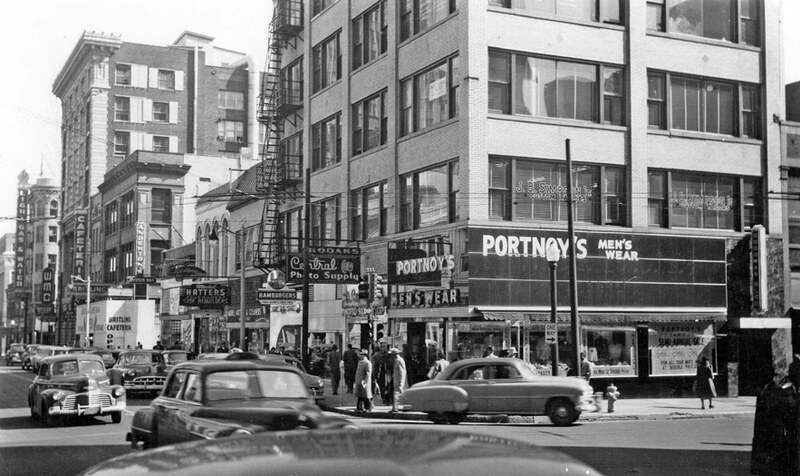 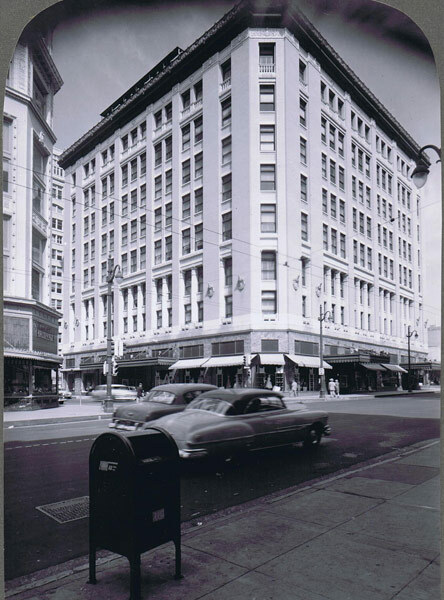 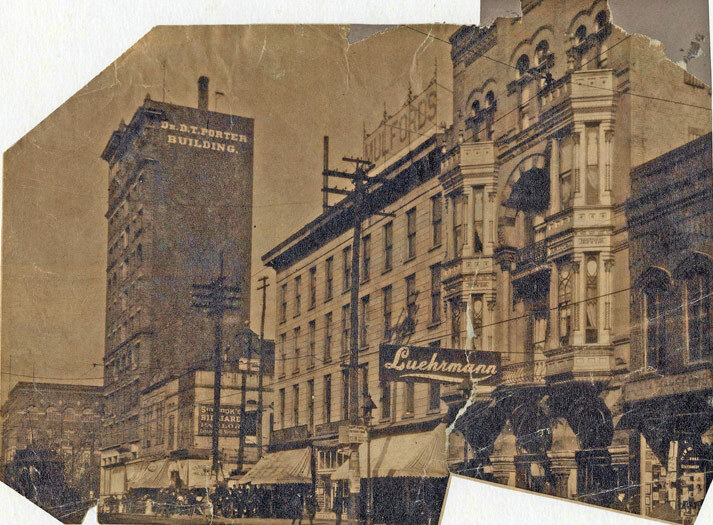 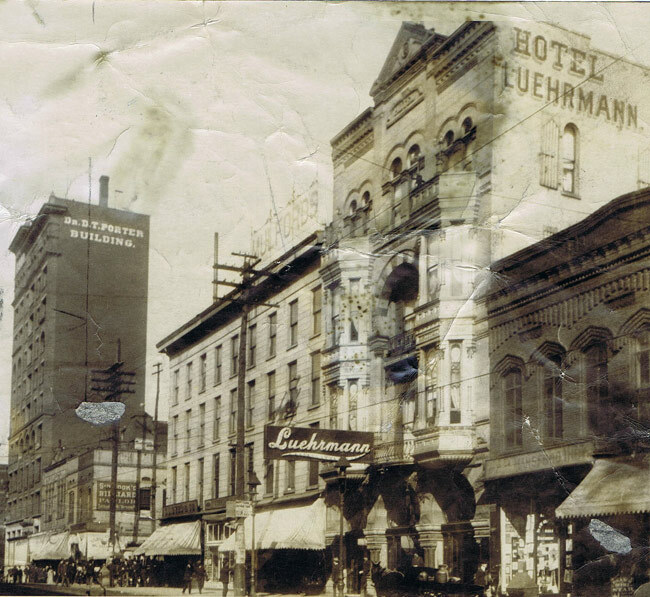 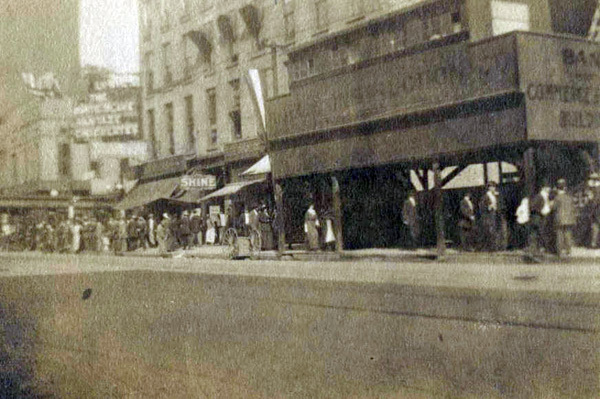 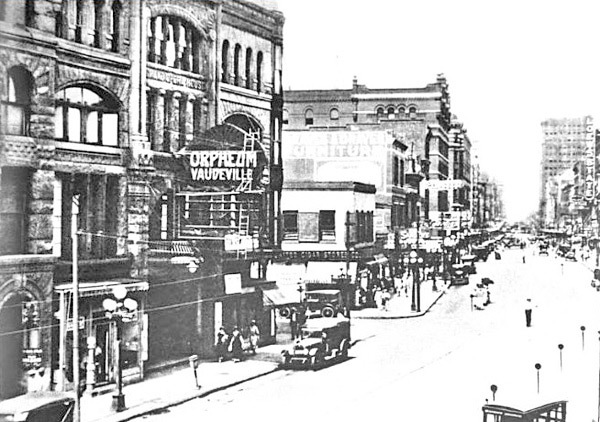 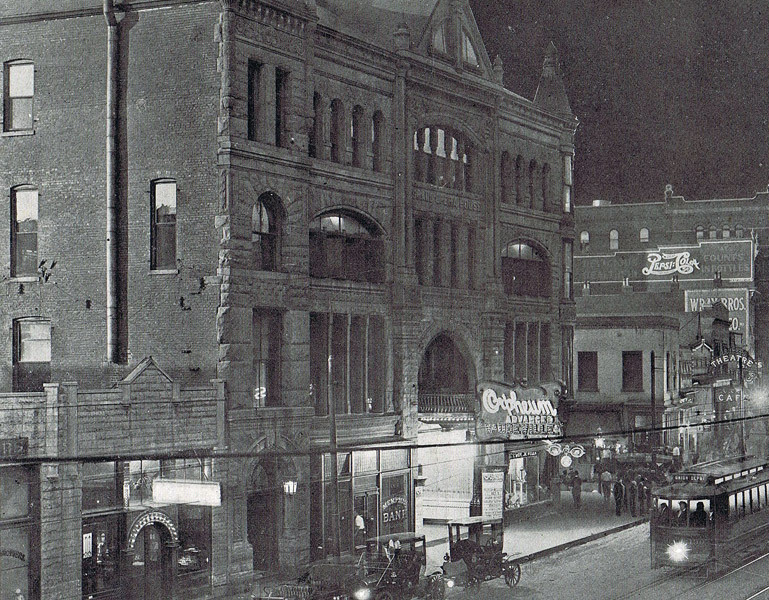 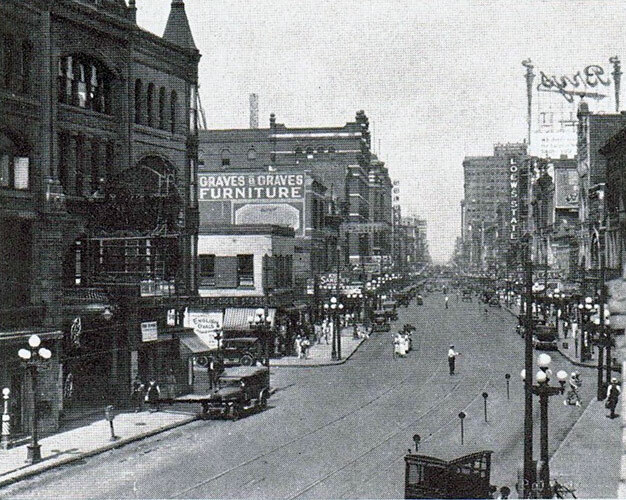 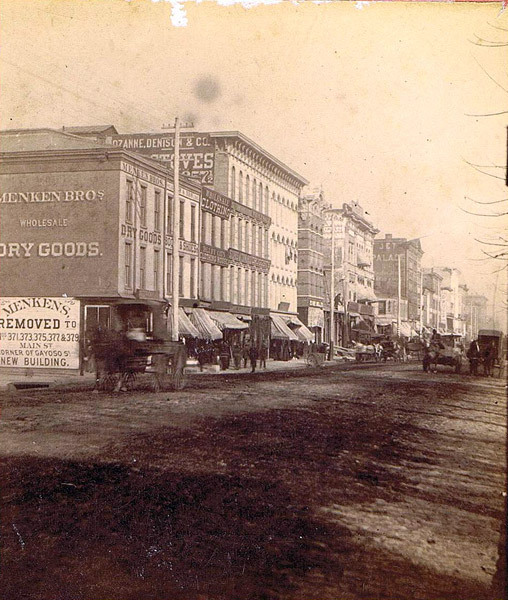 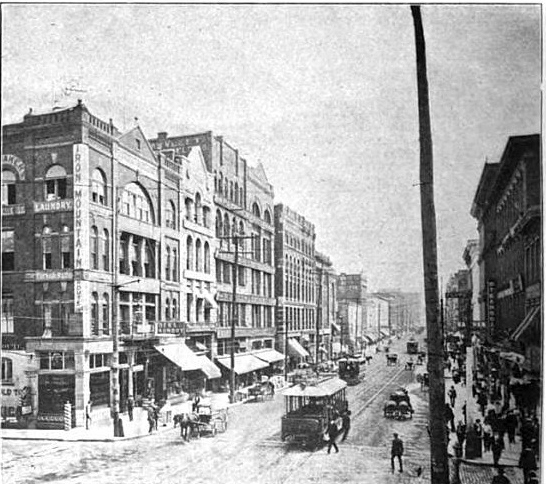 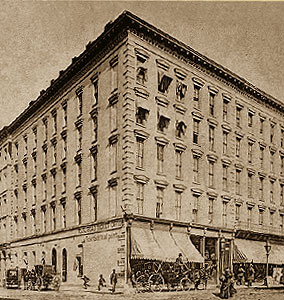 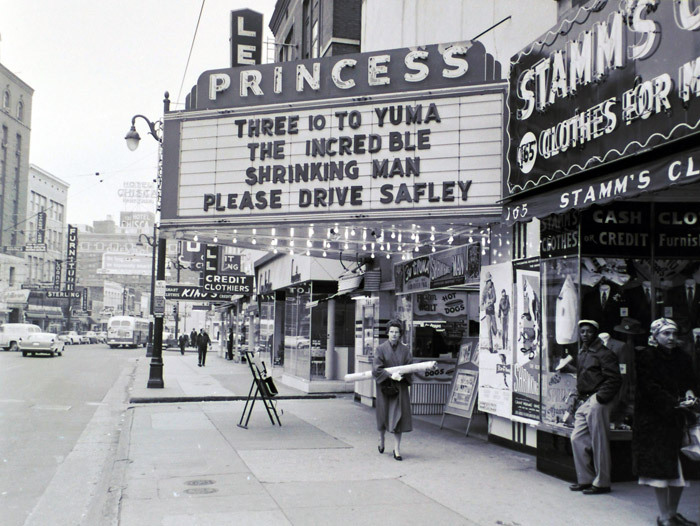 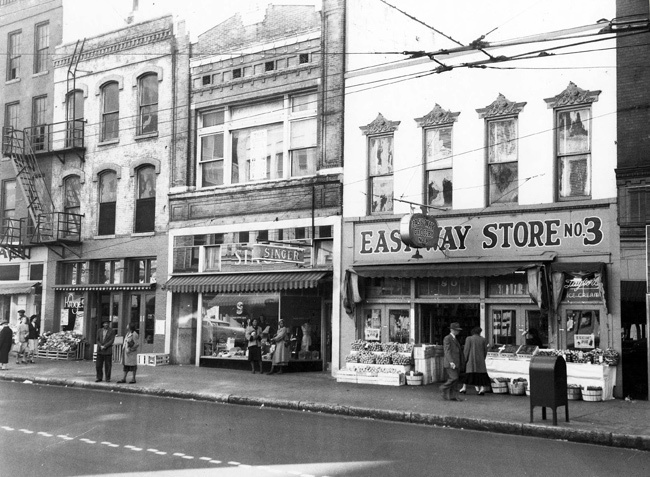 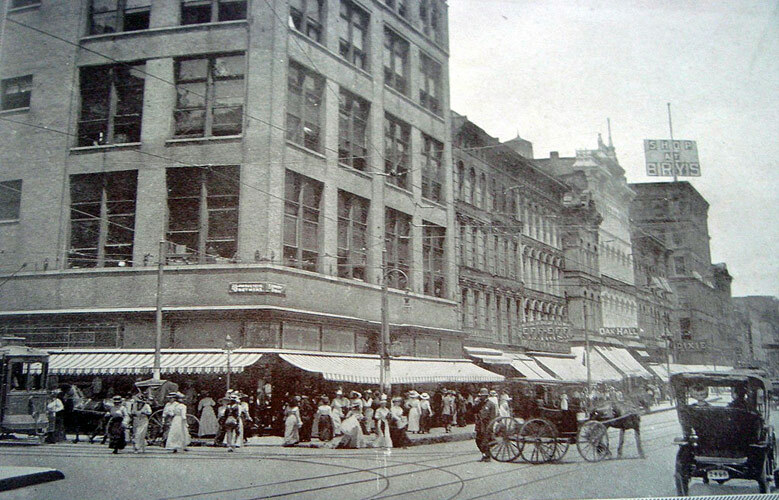 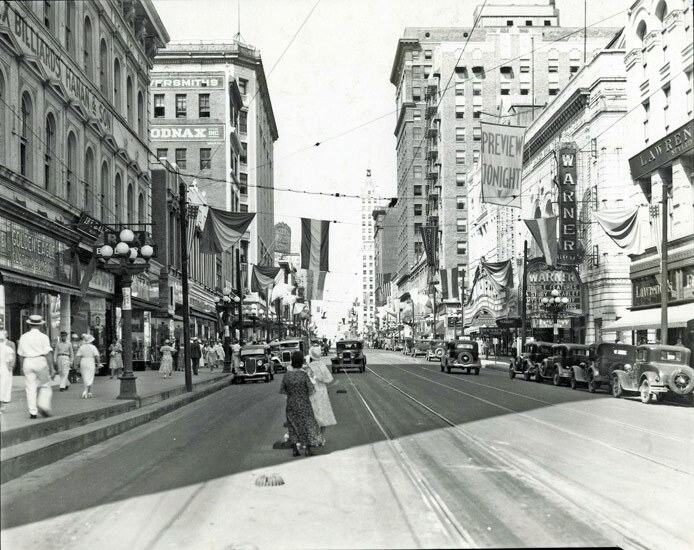 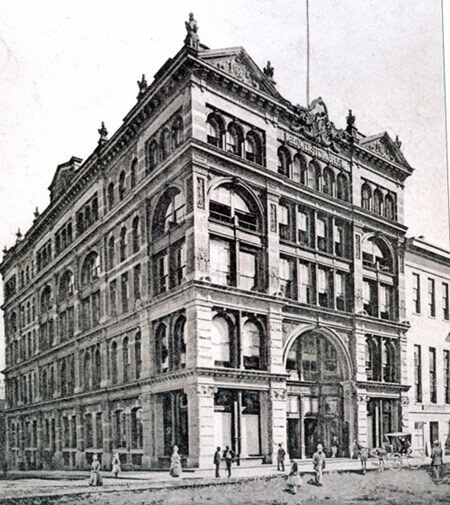 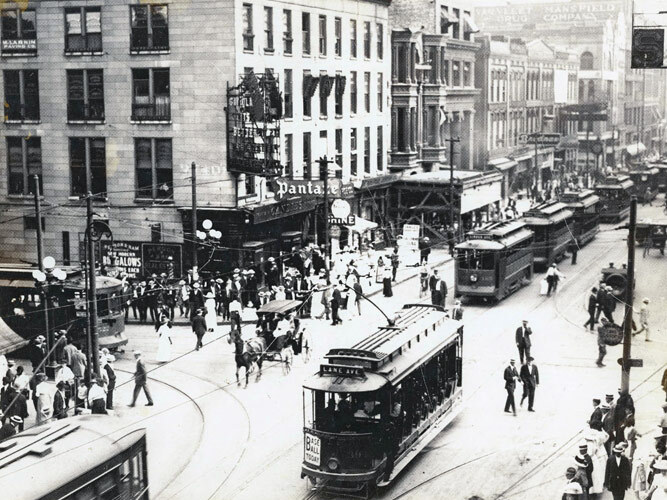 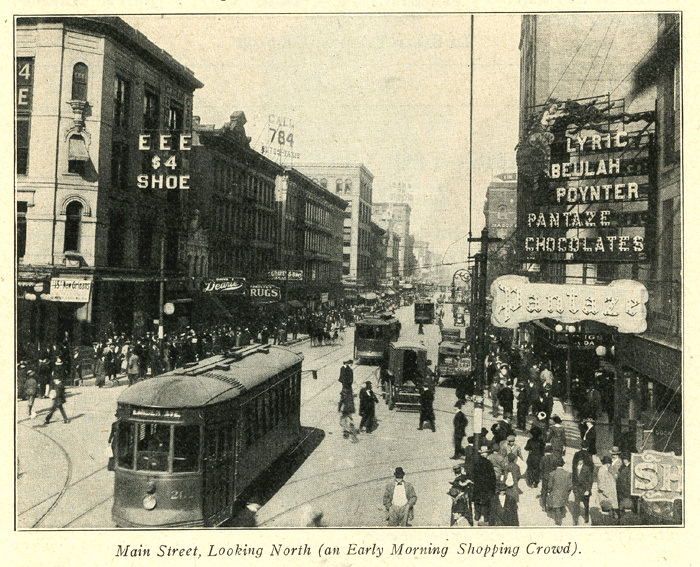 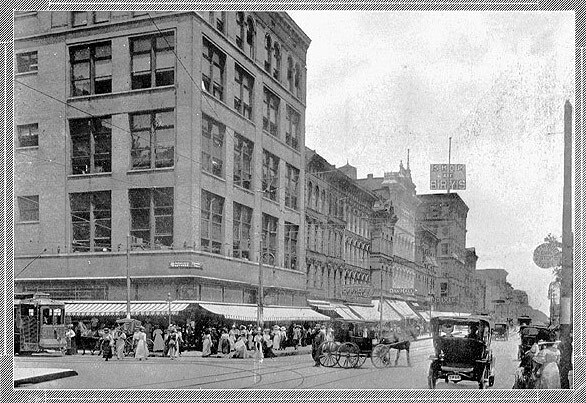 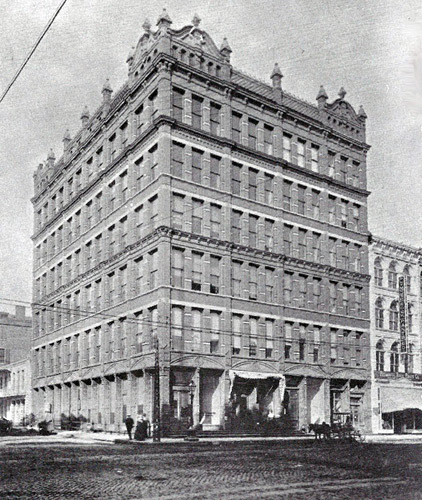 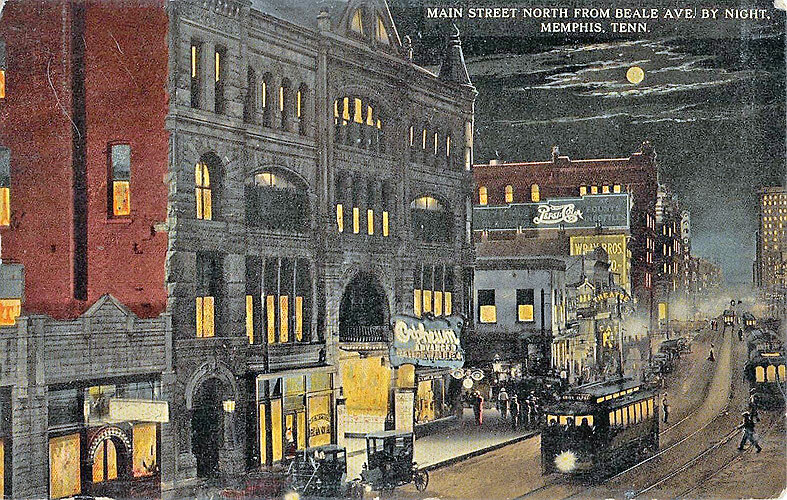 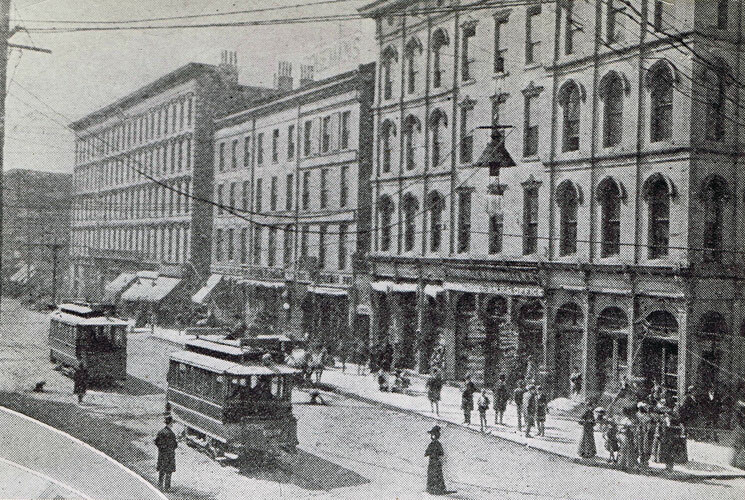 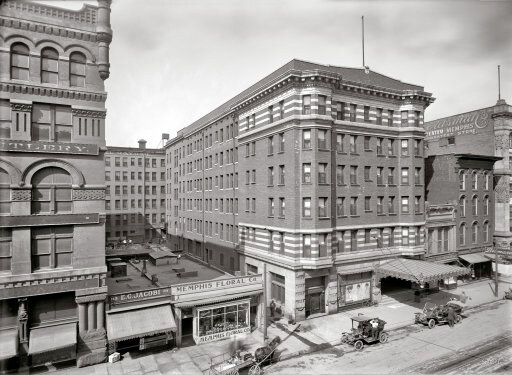 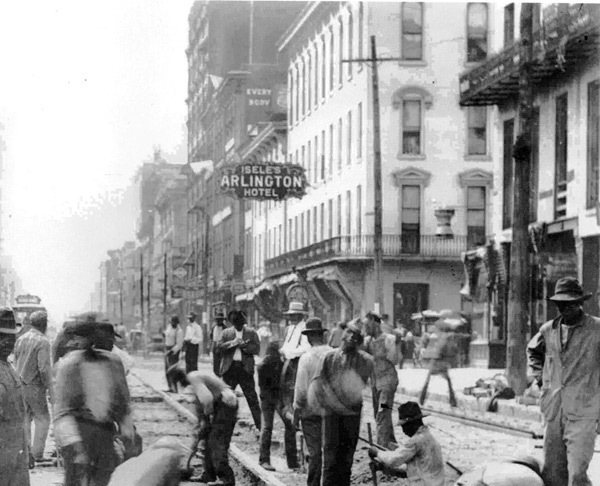 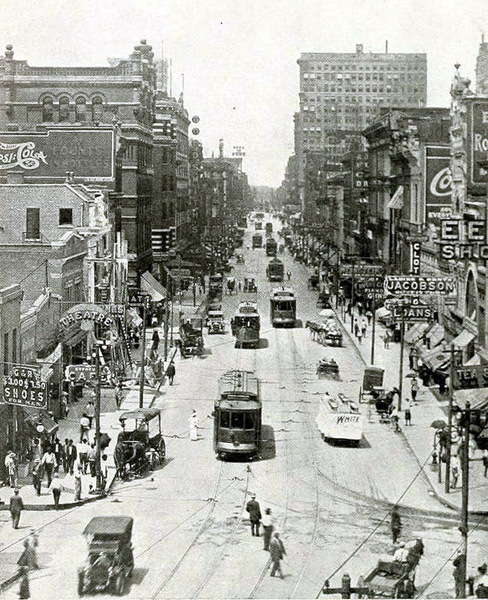 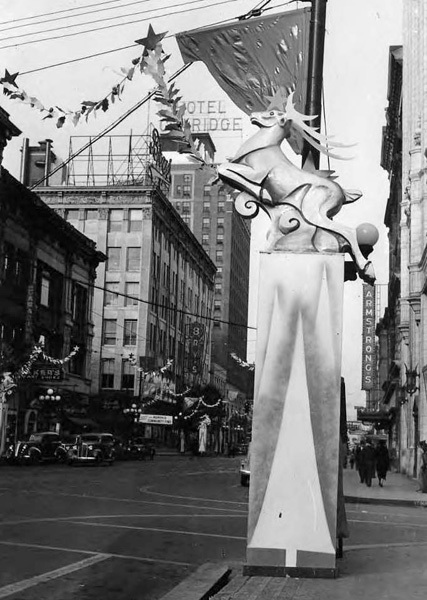 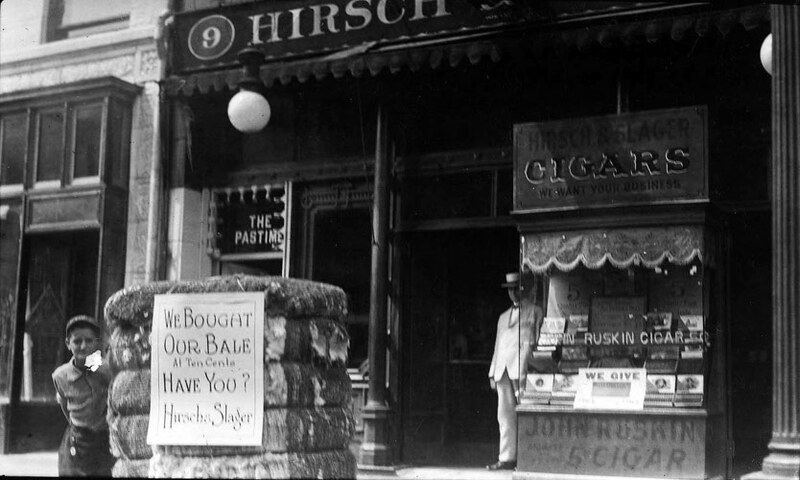 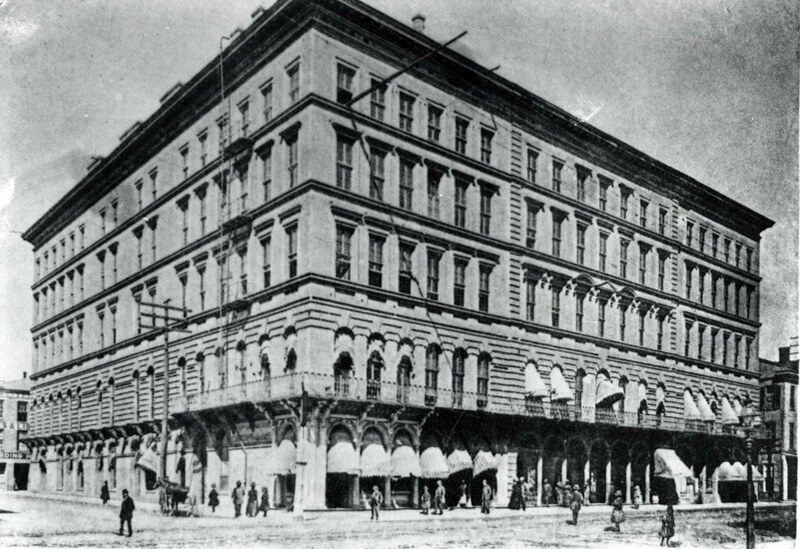 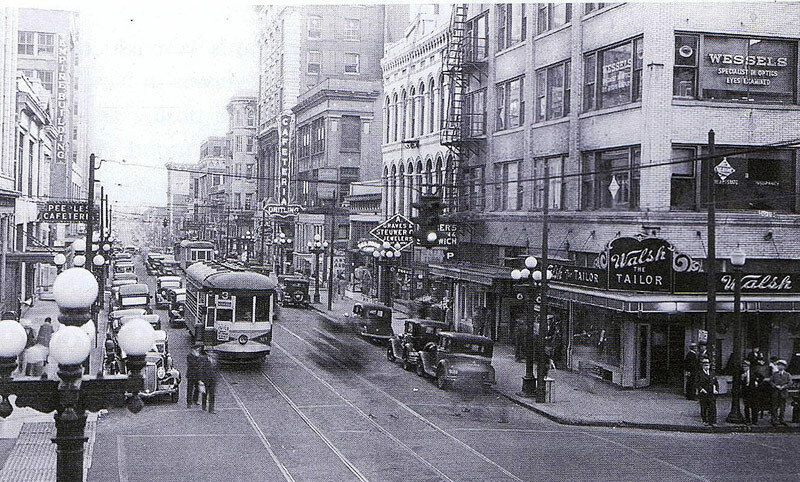 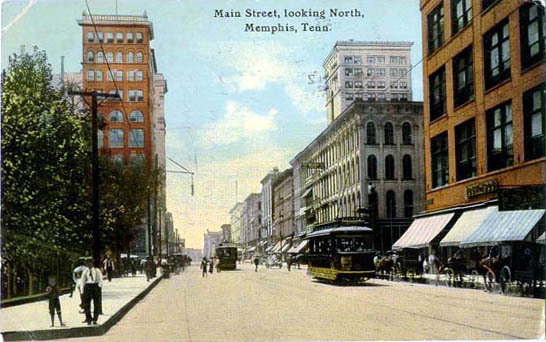 Along Main, one could find all types of shops and businesses, as well as numerous hotels, restaurants, and theatres. 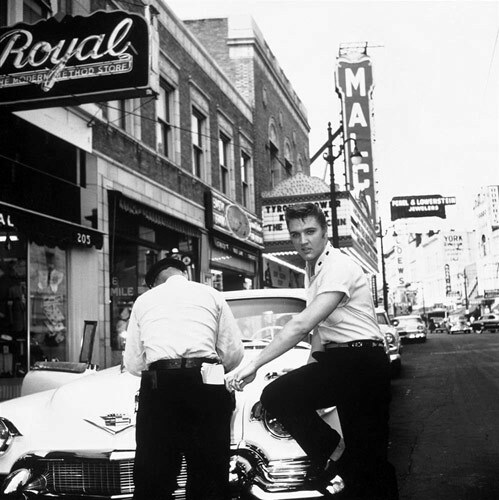 It was the place to see and to be seen. 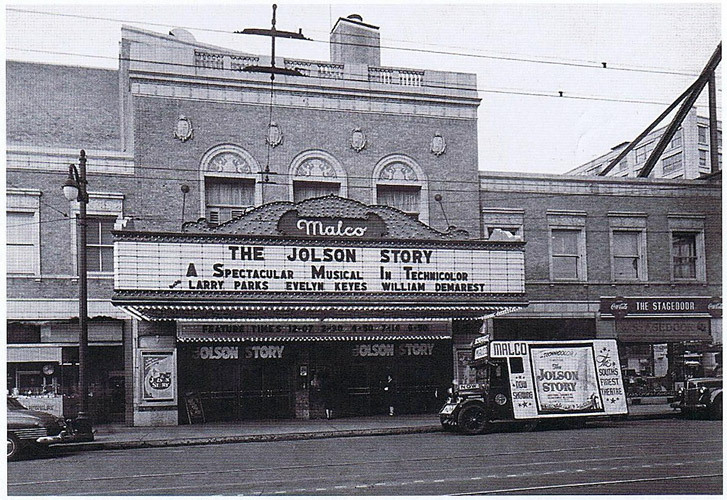 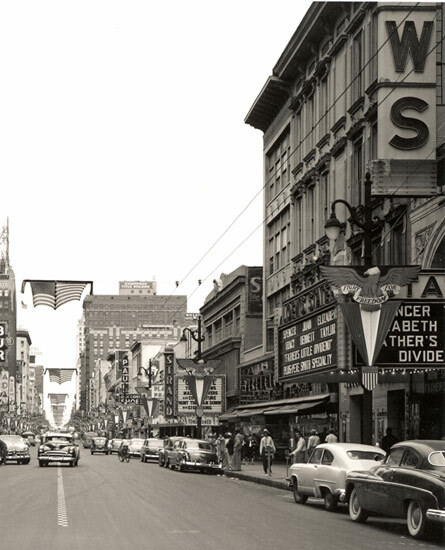 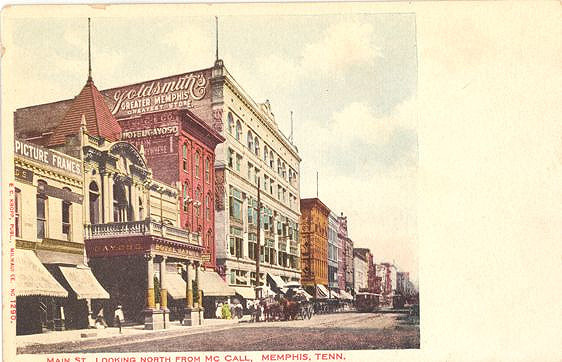 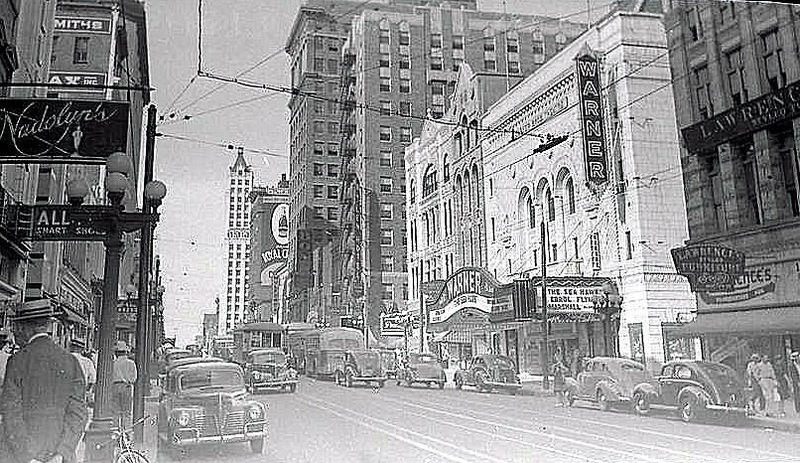 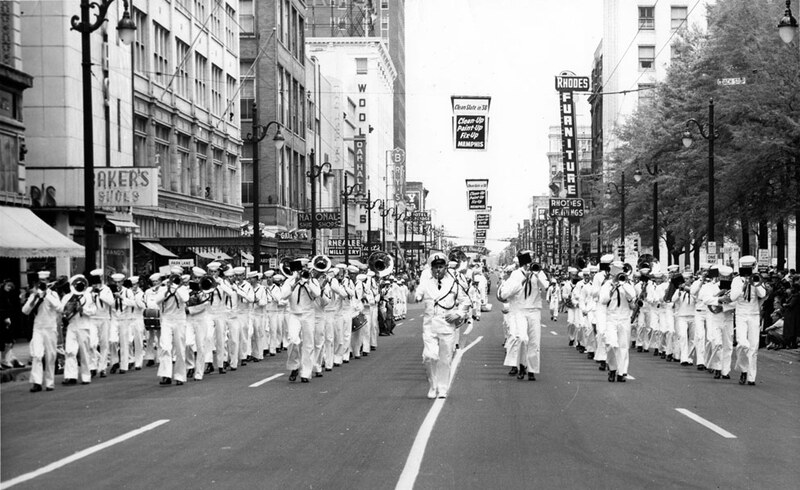 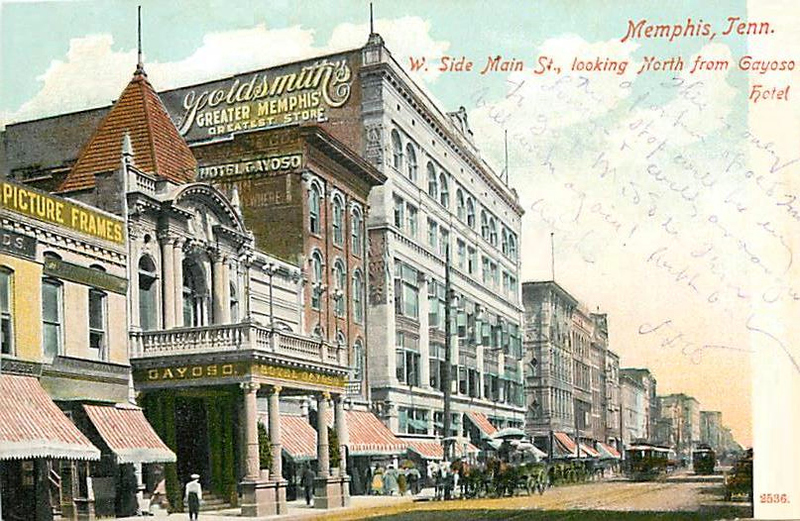 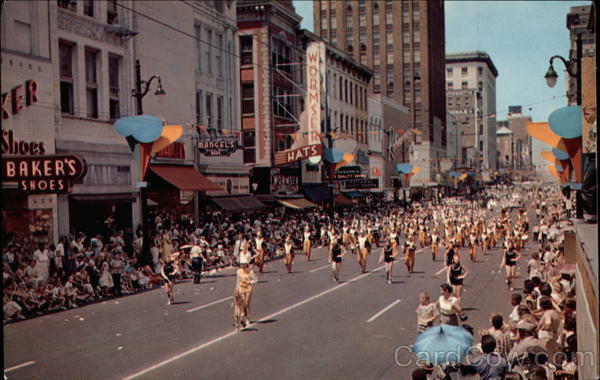 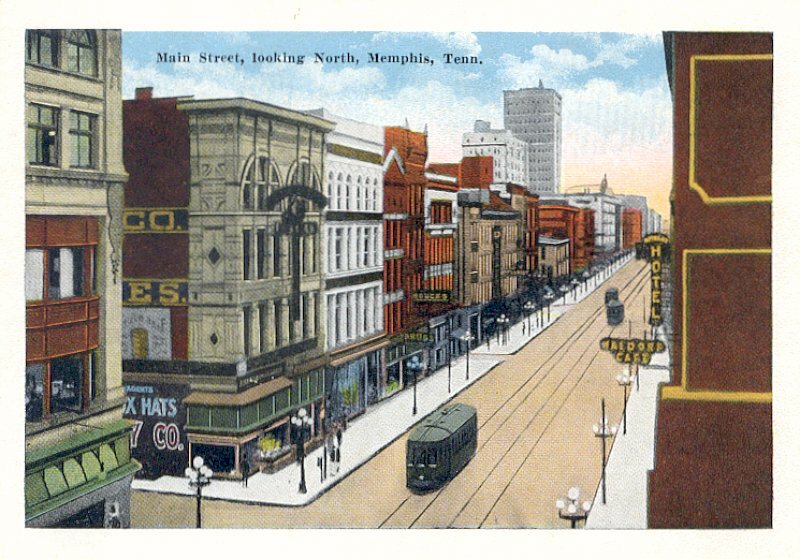 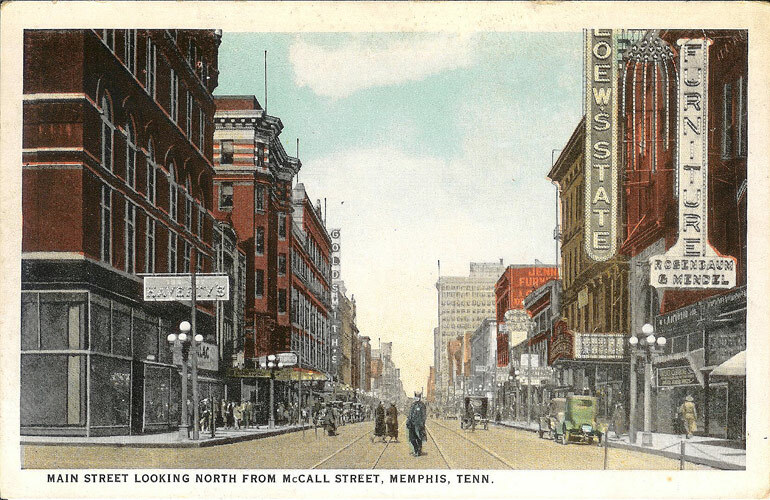 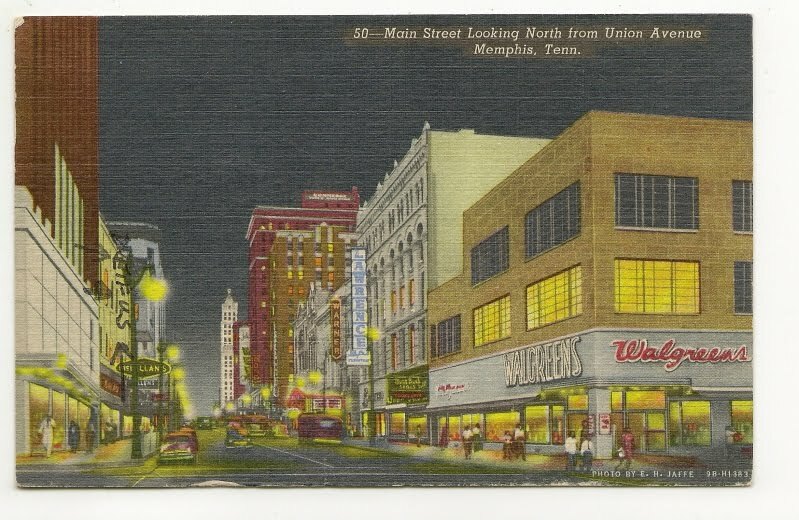 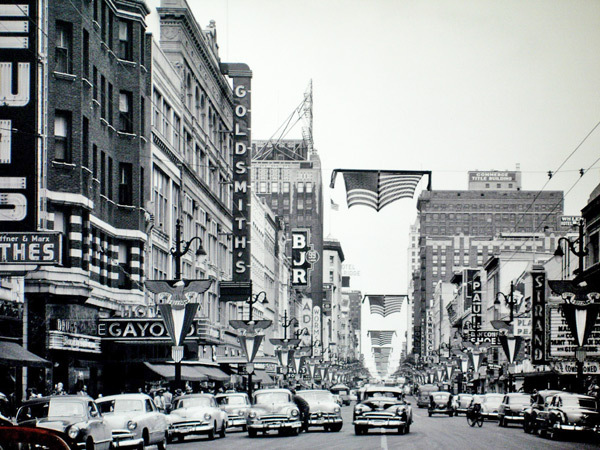 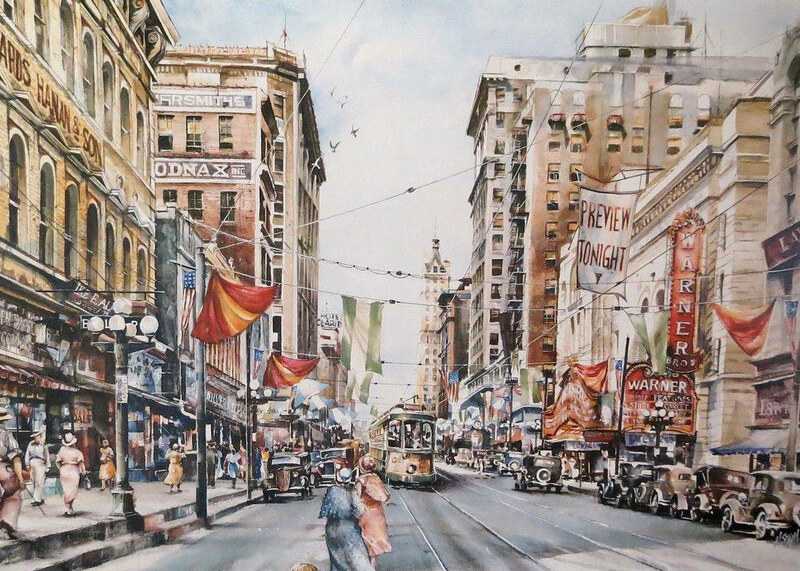 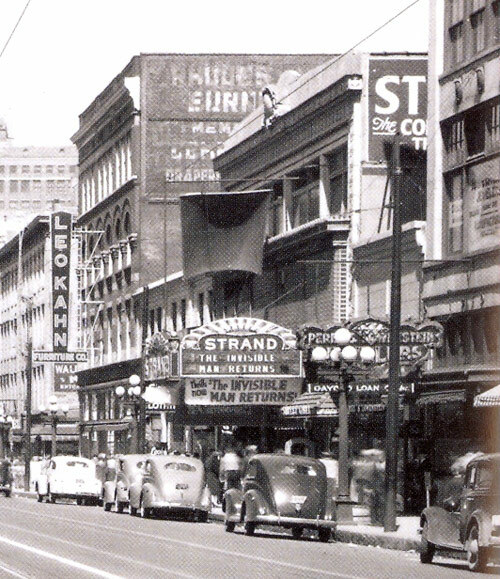 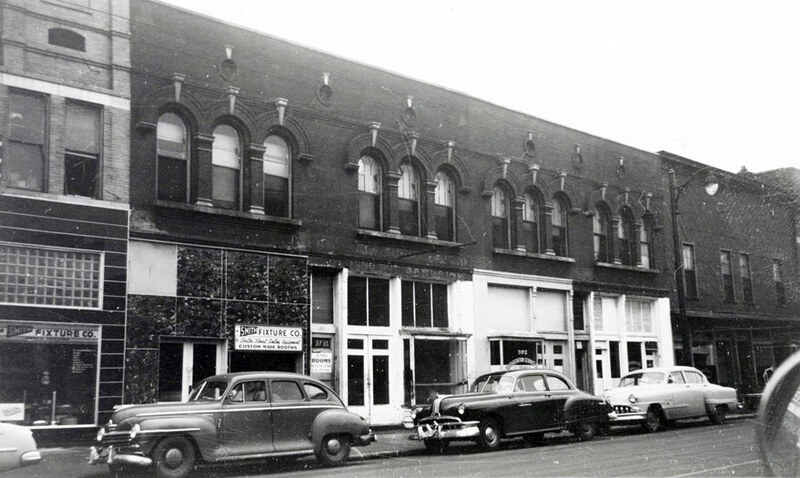 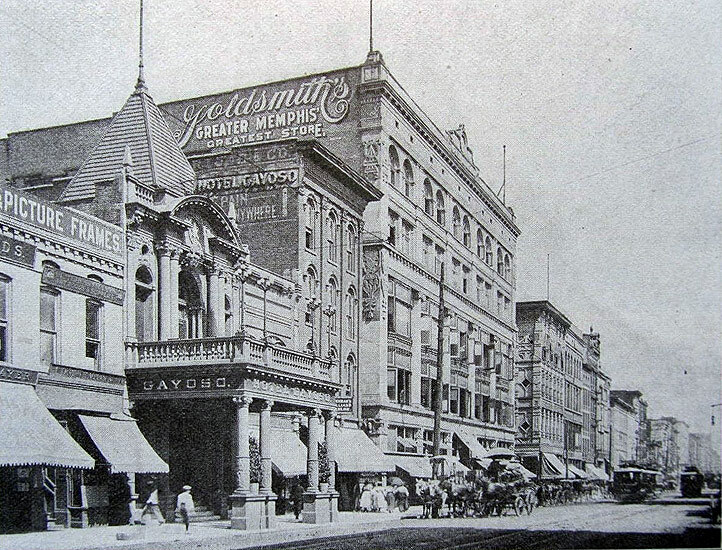 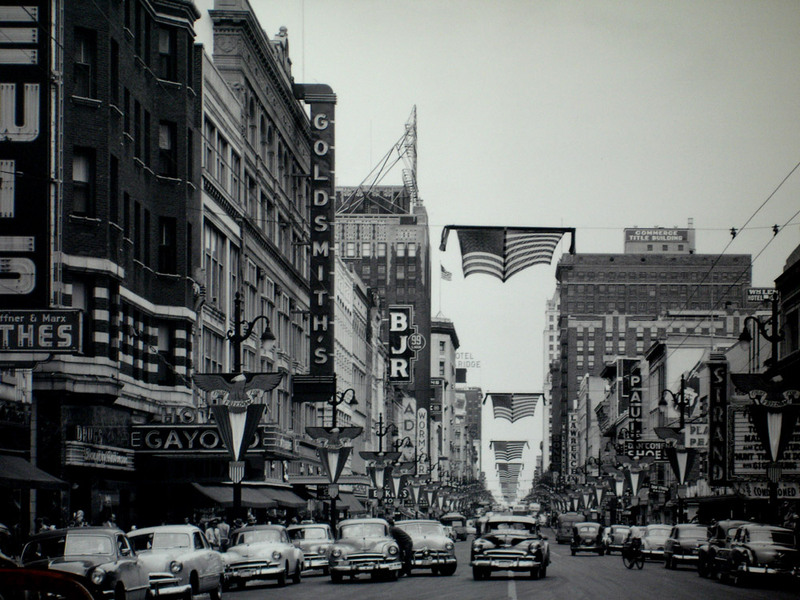 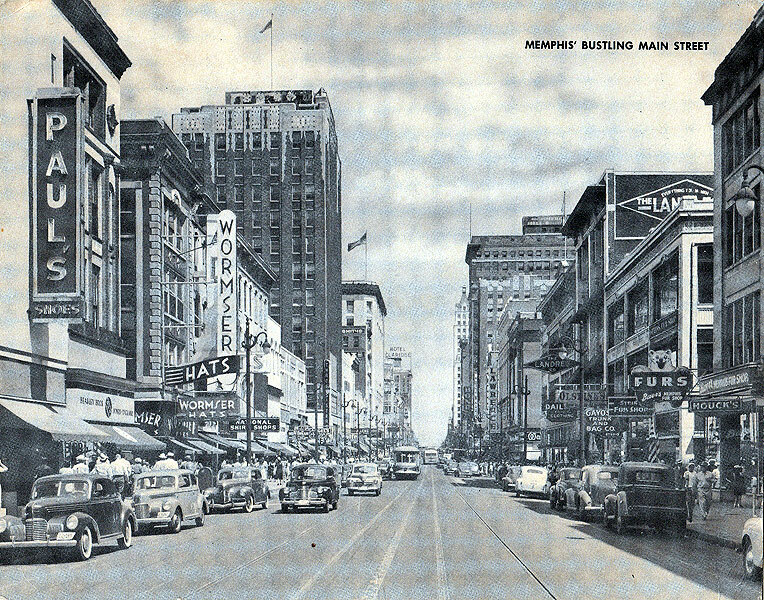 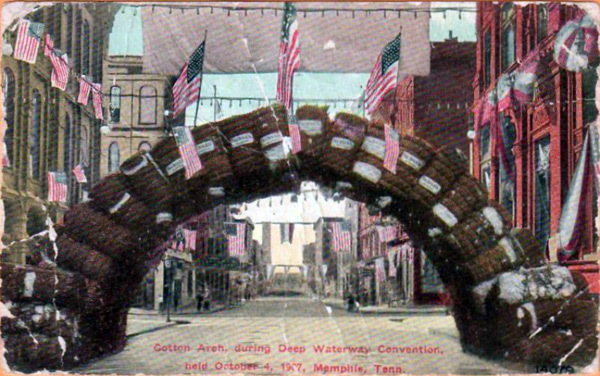 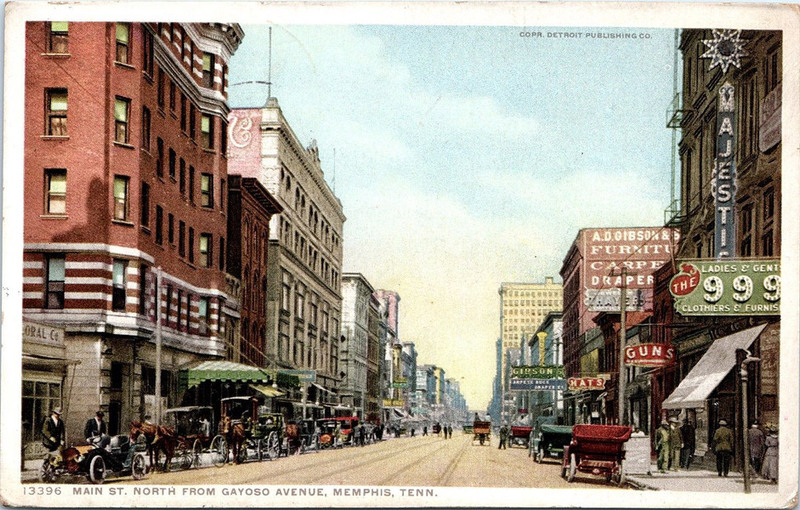 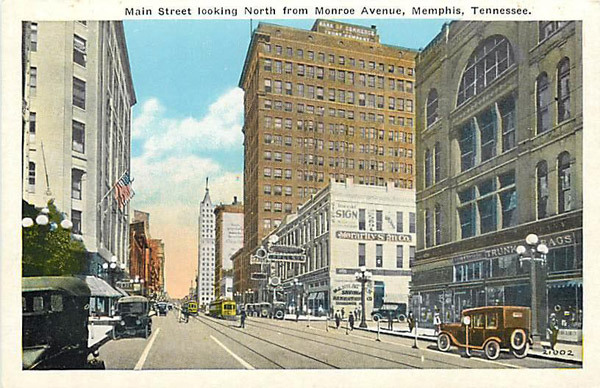 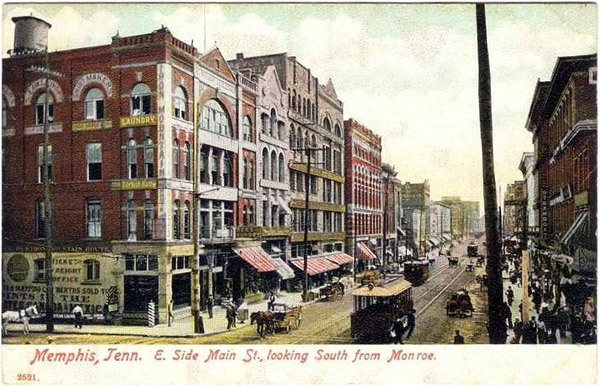 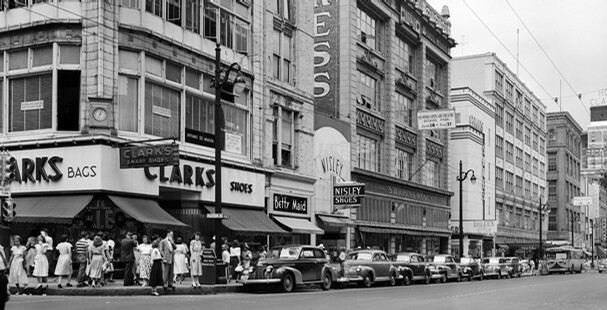 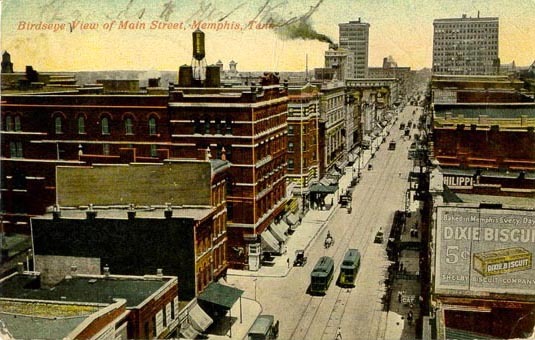 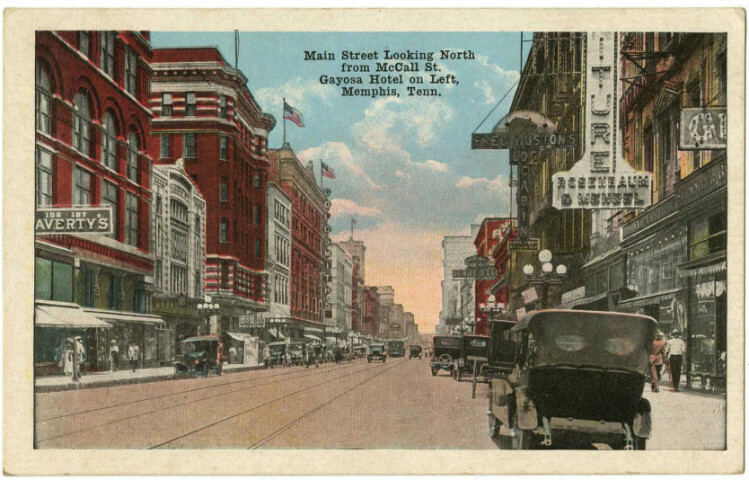 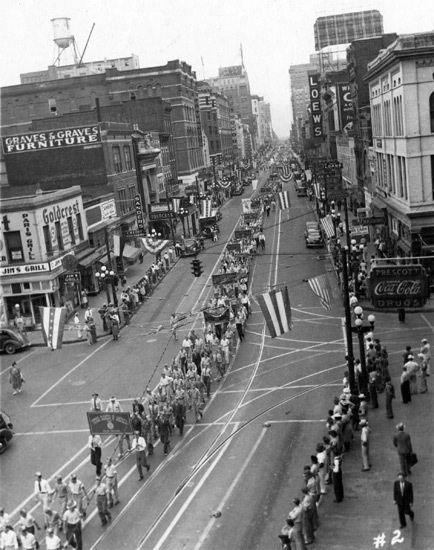 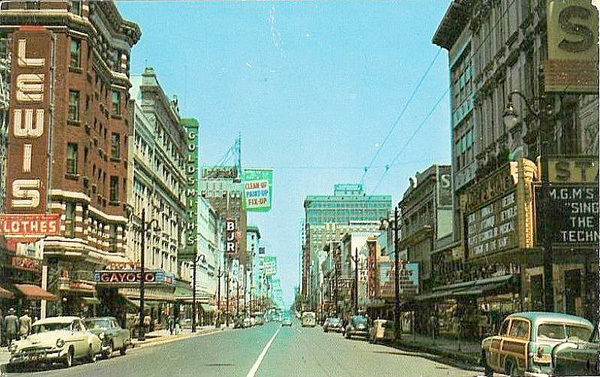 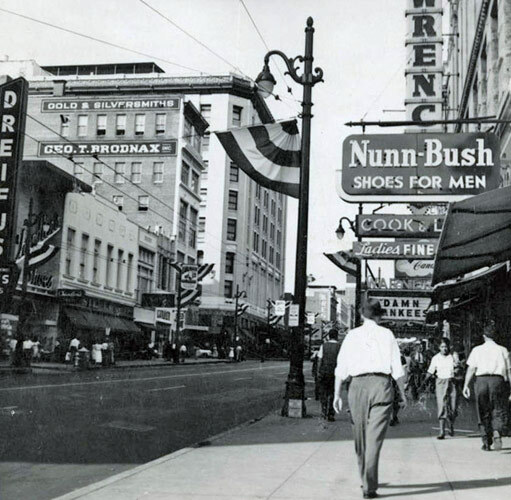 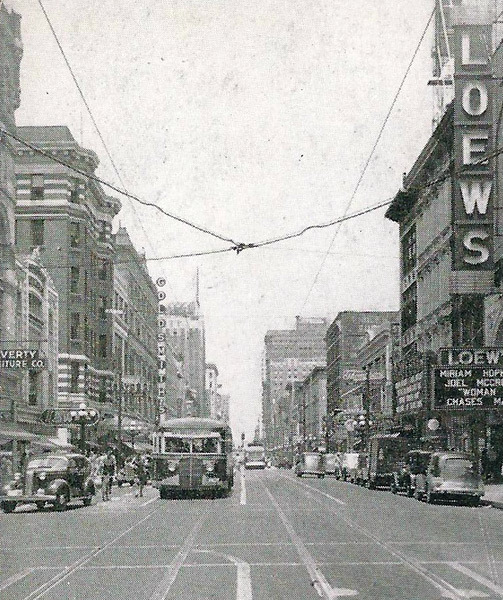 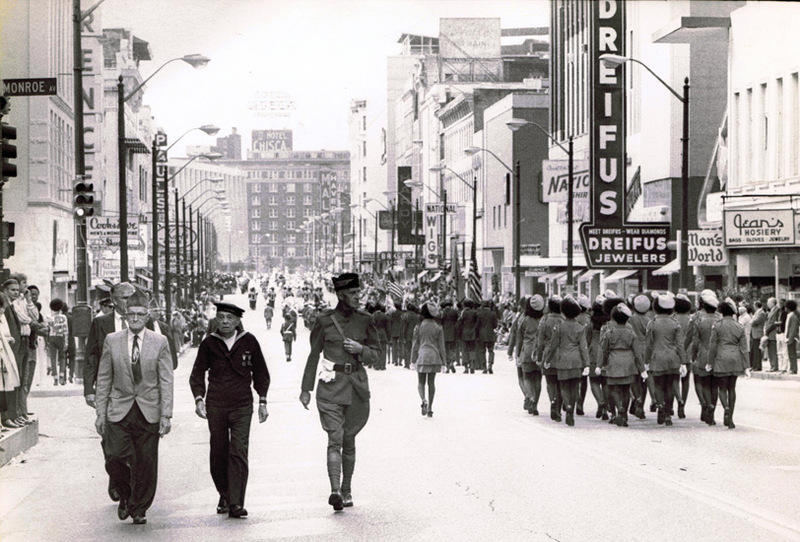 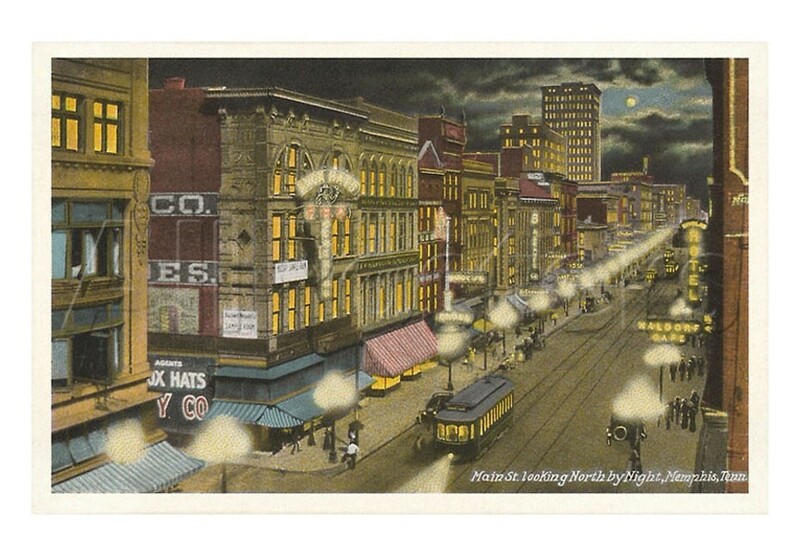 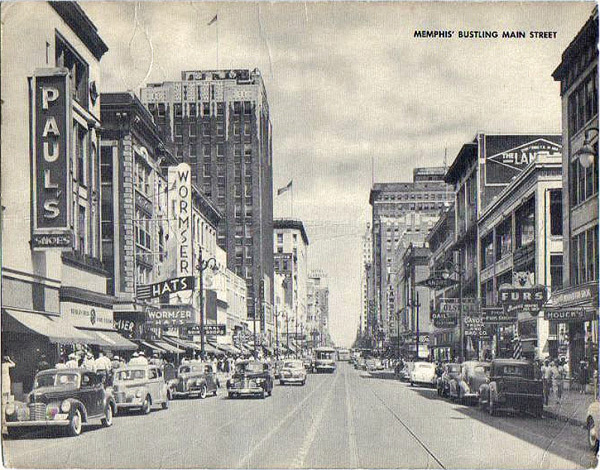 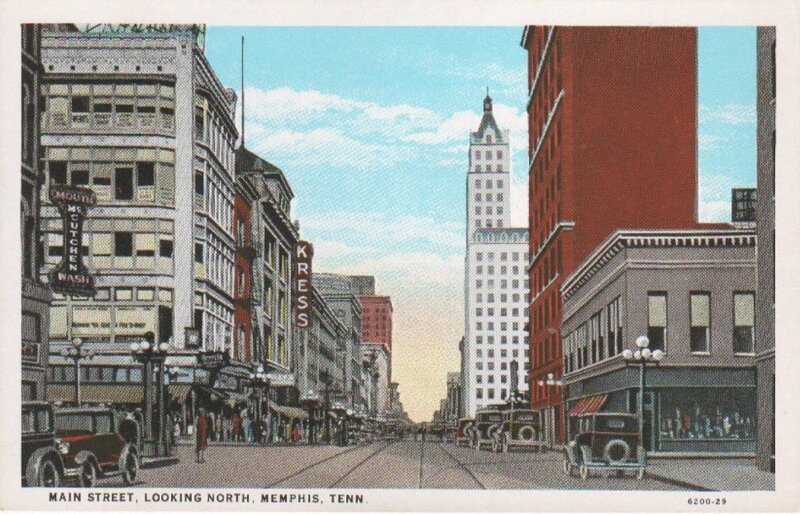 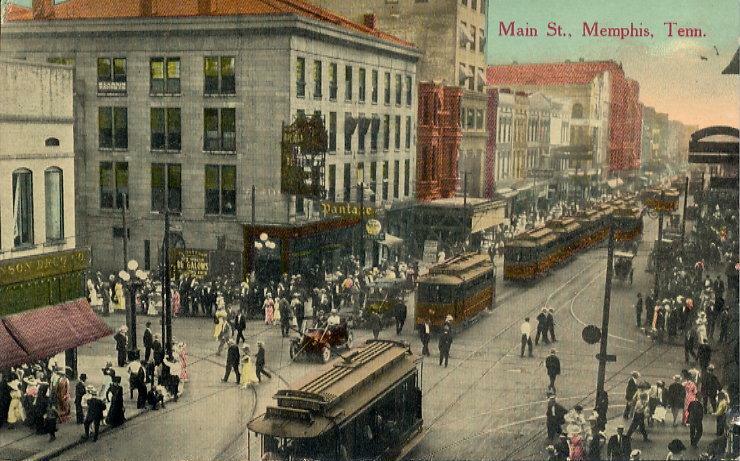 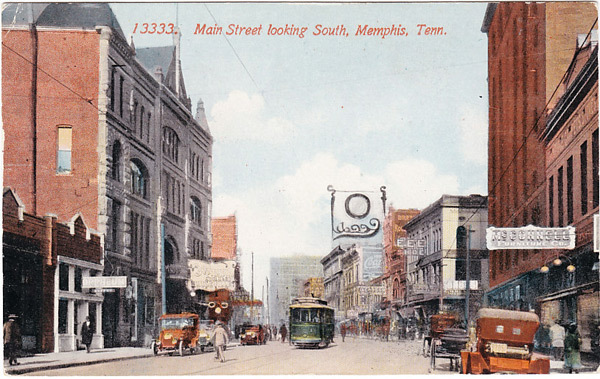 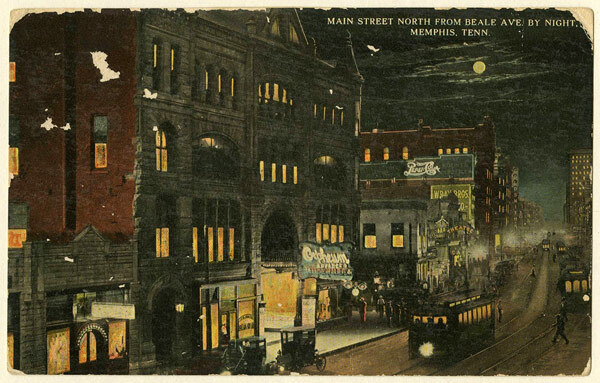 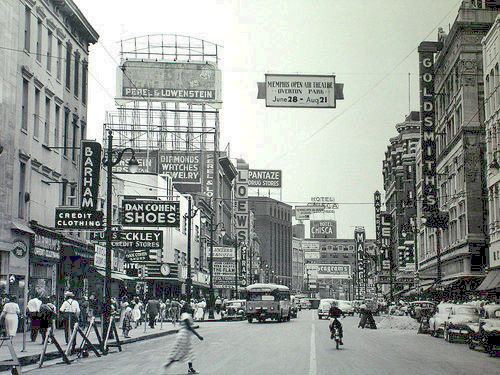 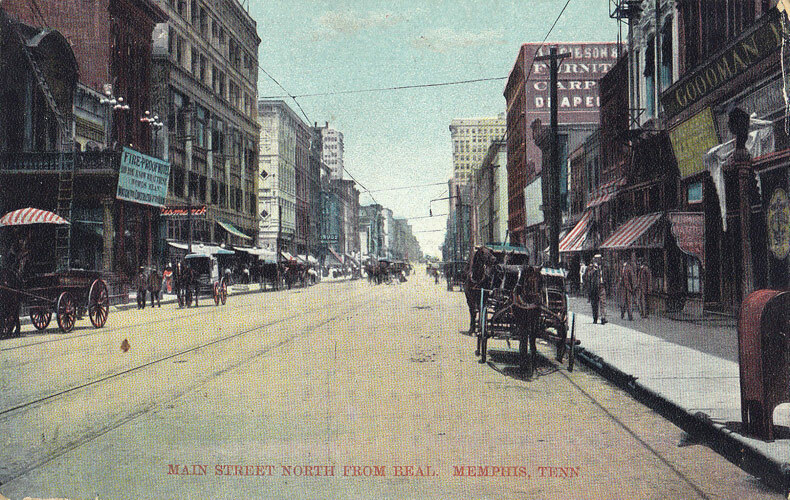 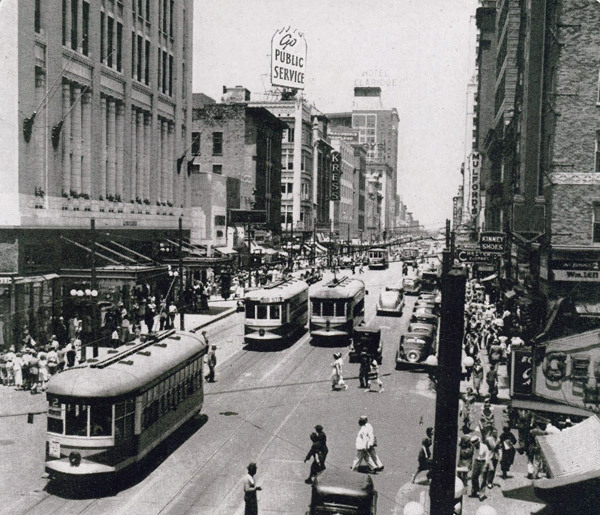 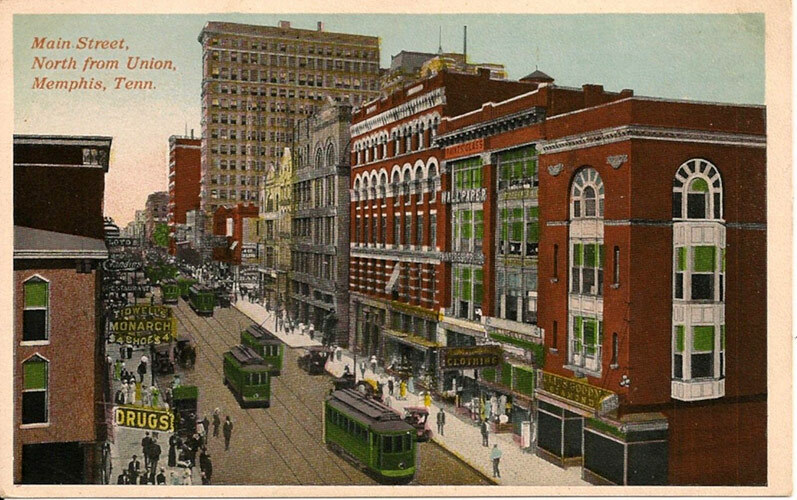 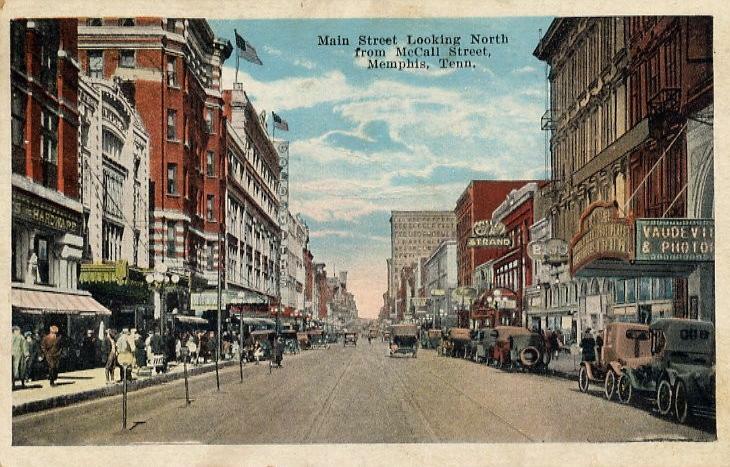 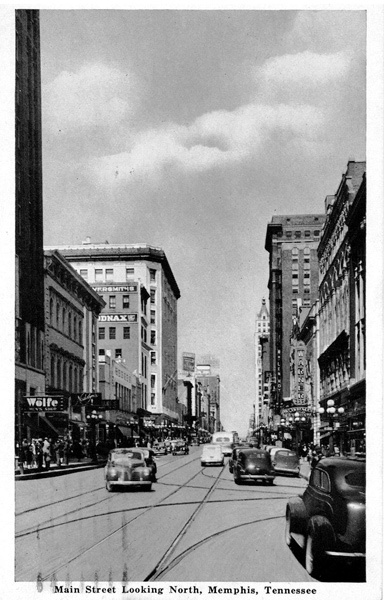 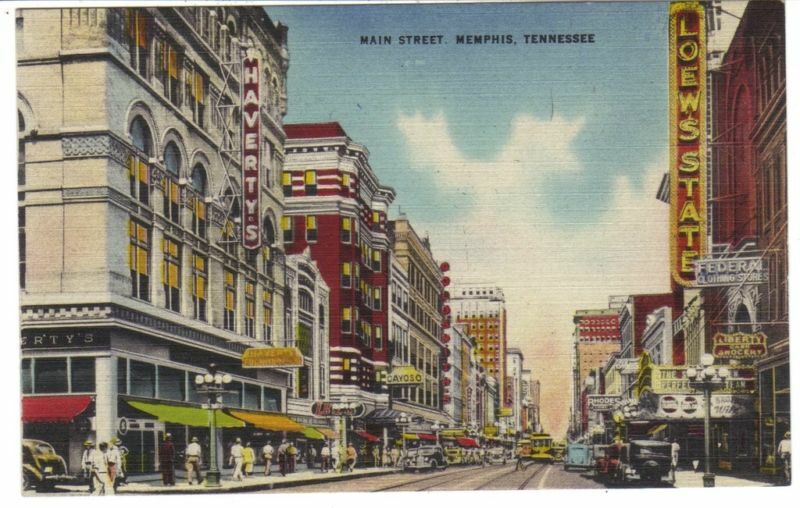 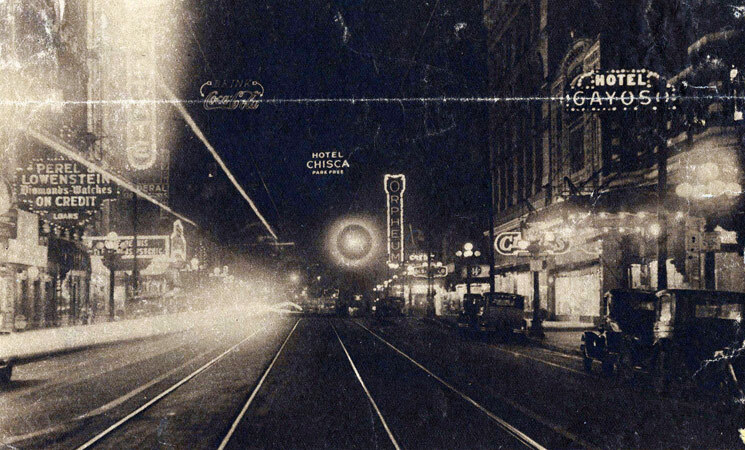 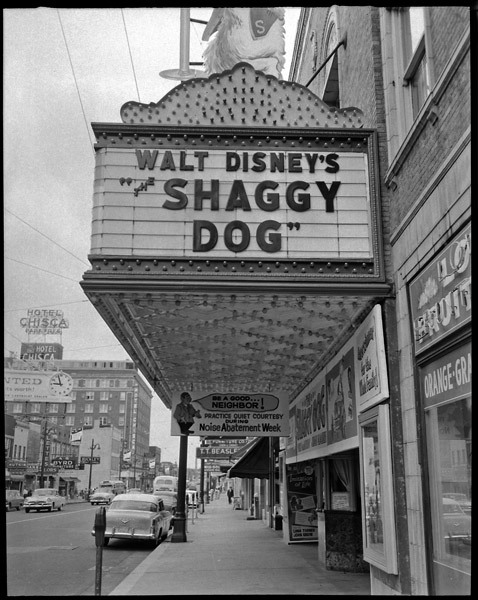 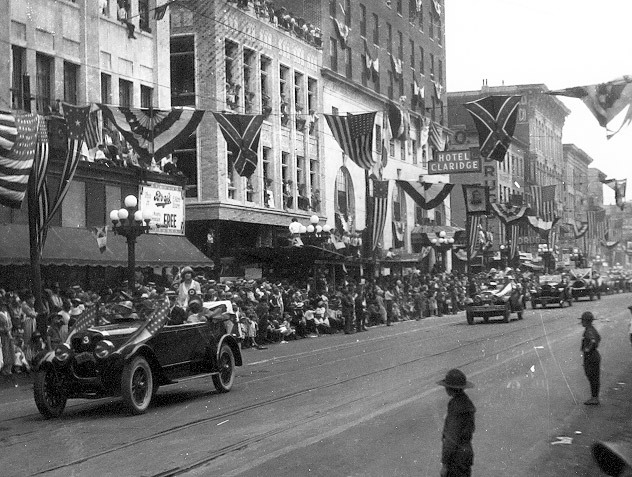 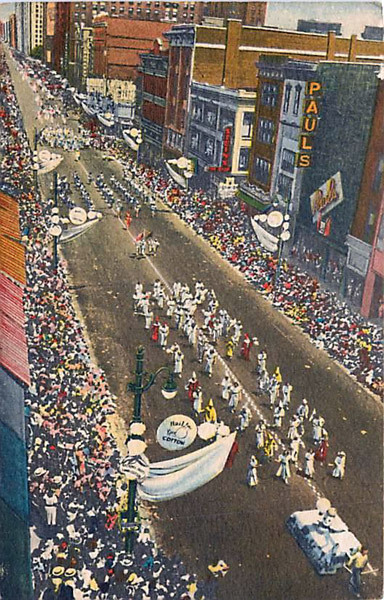 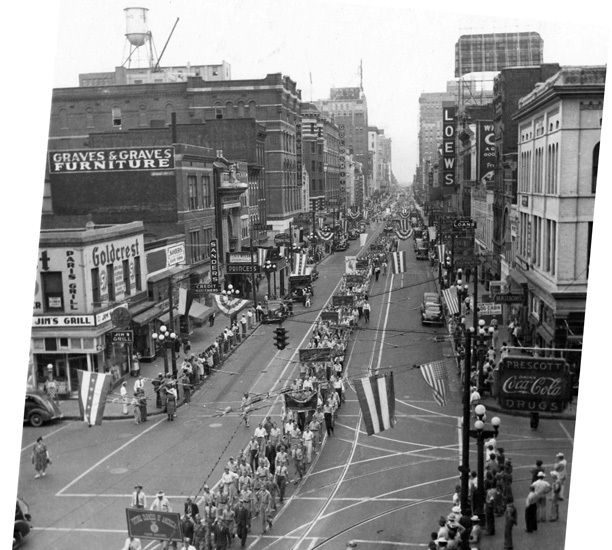 As the town grew into a major city, most Memphians thought of Main Street as the section from Court Square down to the Orpheum-Malco or Beale Street. 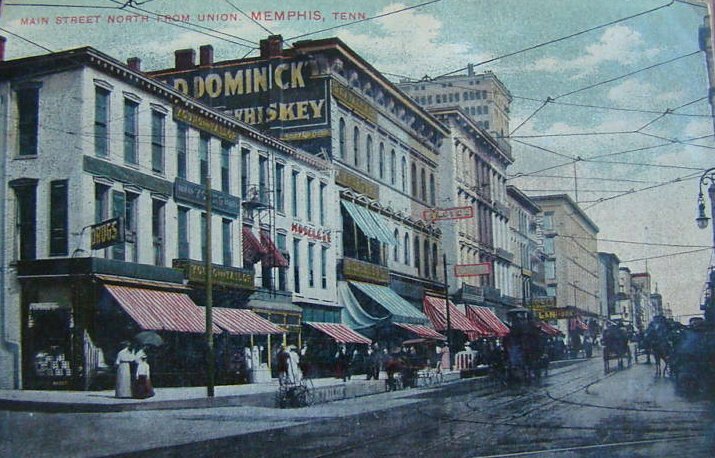 These 12 blocks were an easy walk. 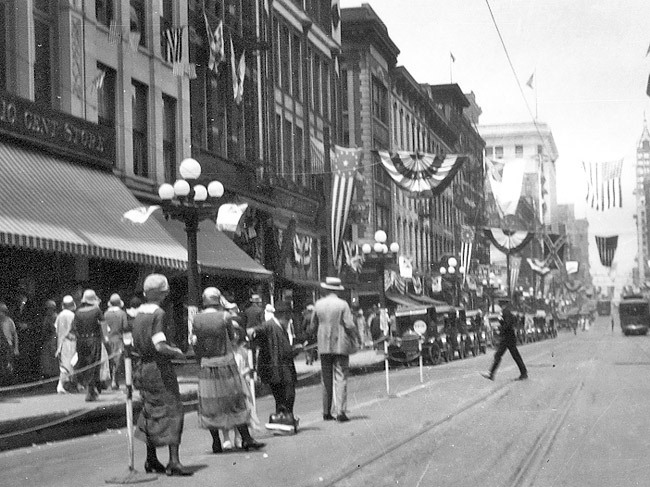 Going downtown became a dressy occasion and an "event". 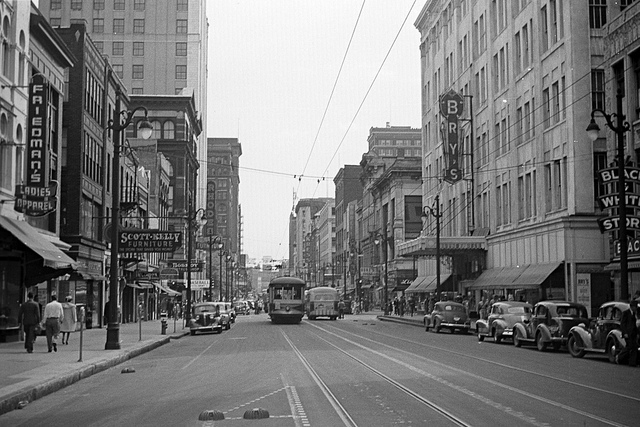 One would generally spend the whole day - shopping, lunch, and then the theatre or a movie, and possibly, dinner. 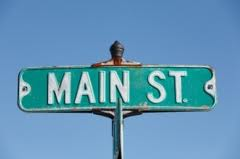 But by the late 20th century, Main Street had fallen on hard times. 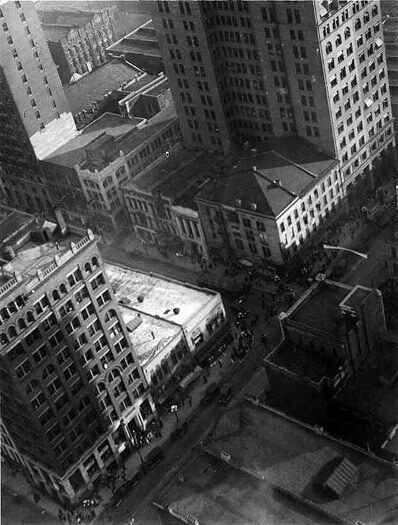 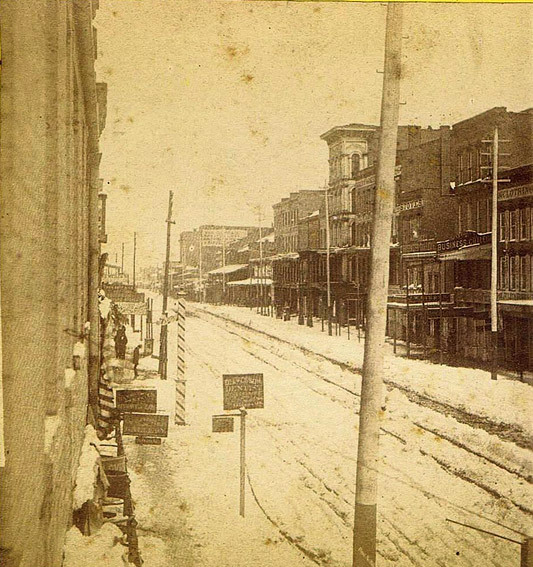 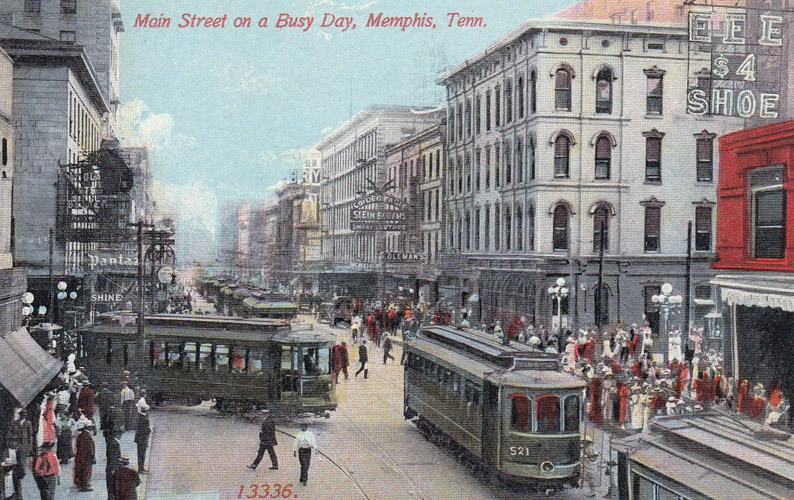 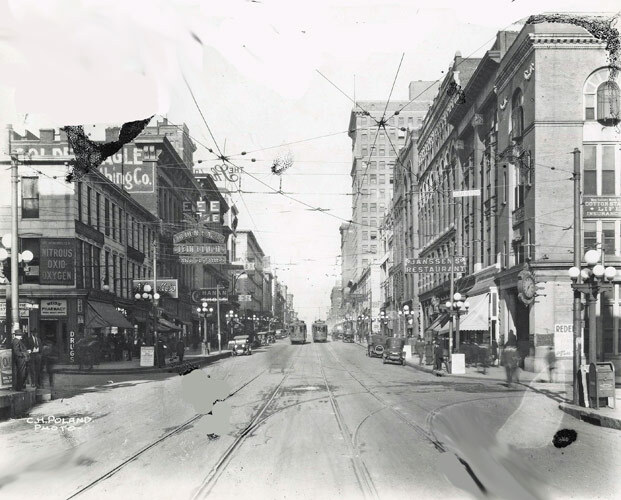 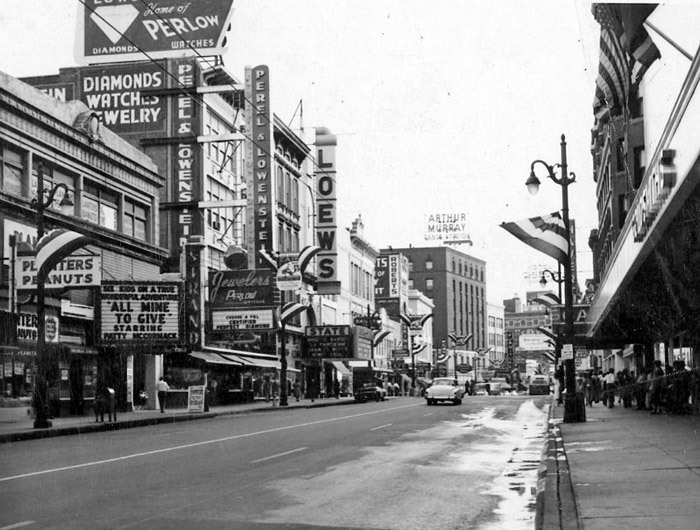 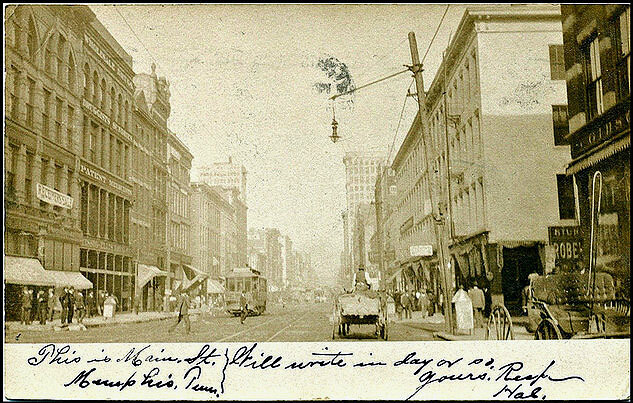 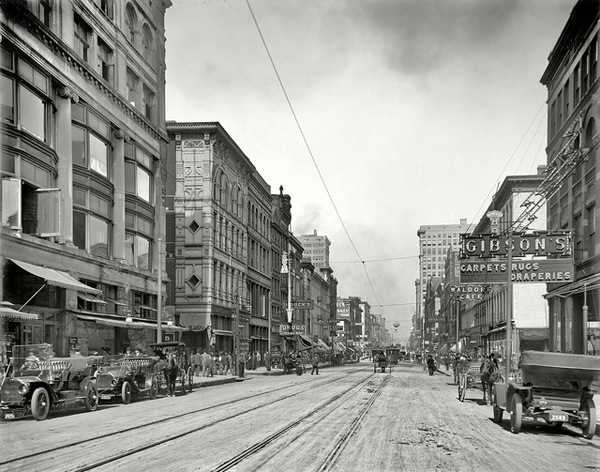 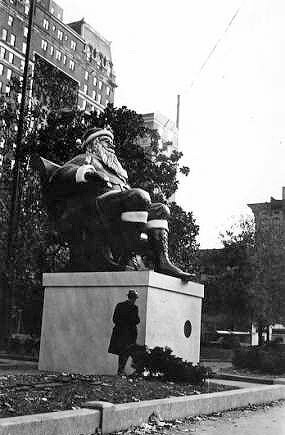 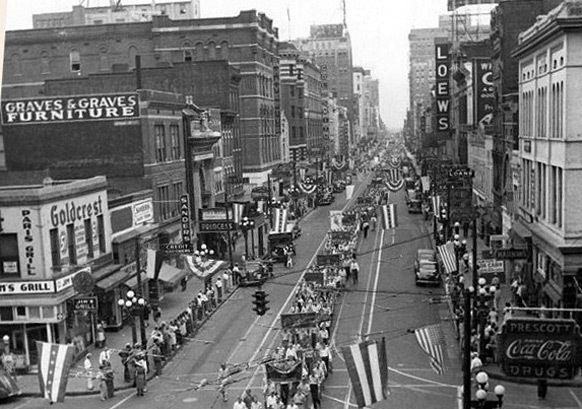 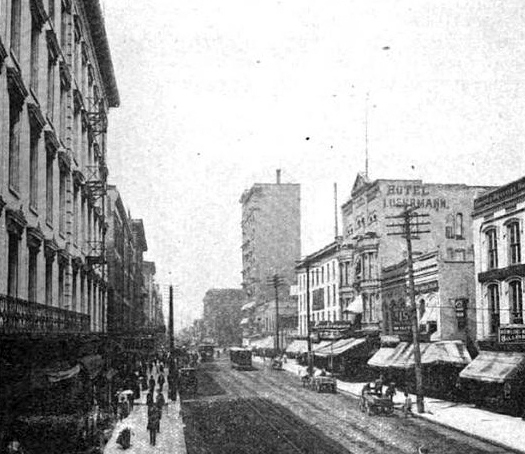 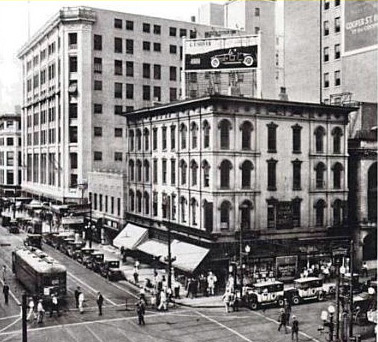 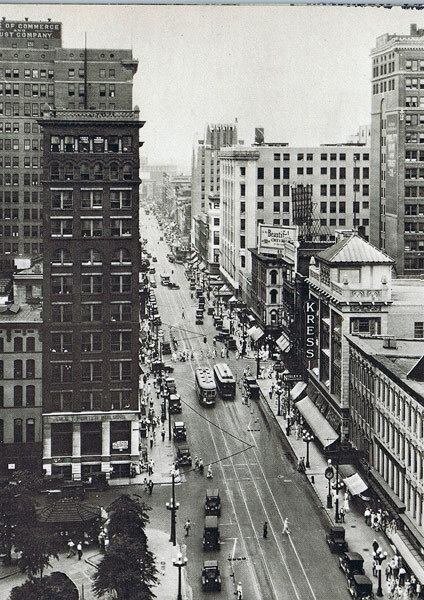 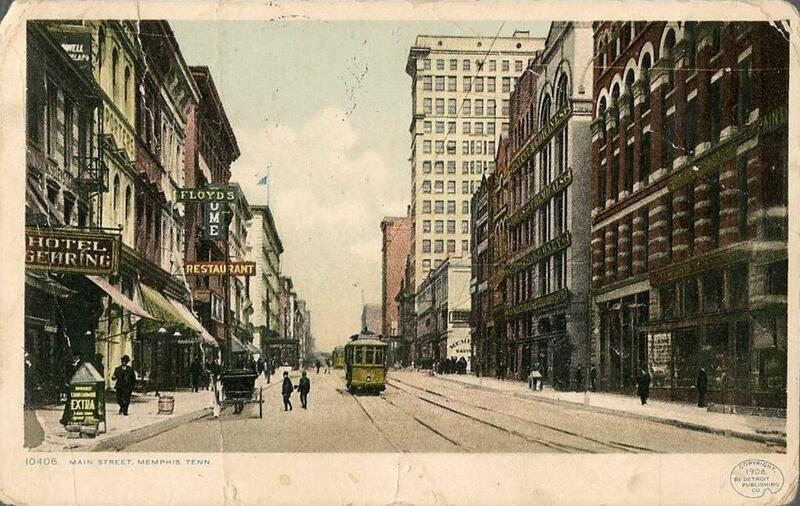 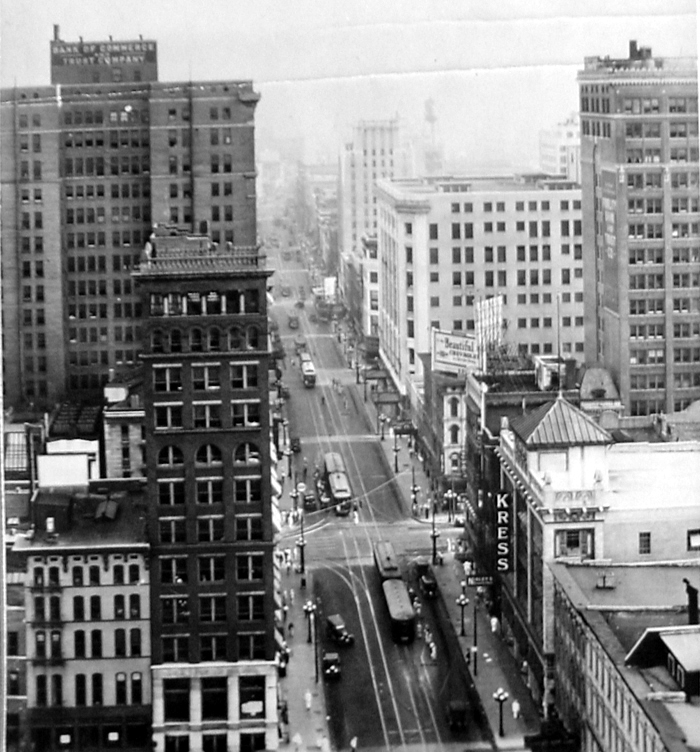 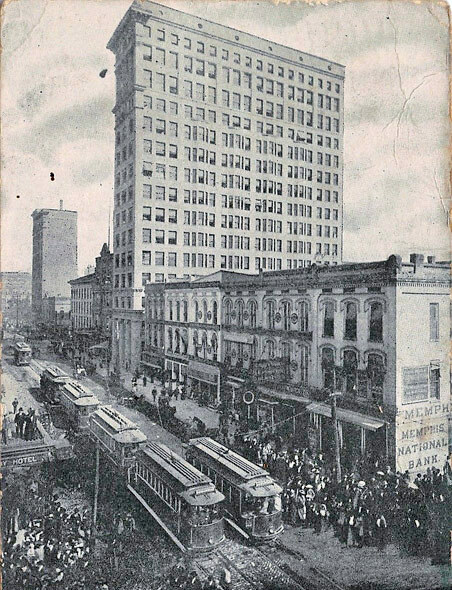 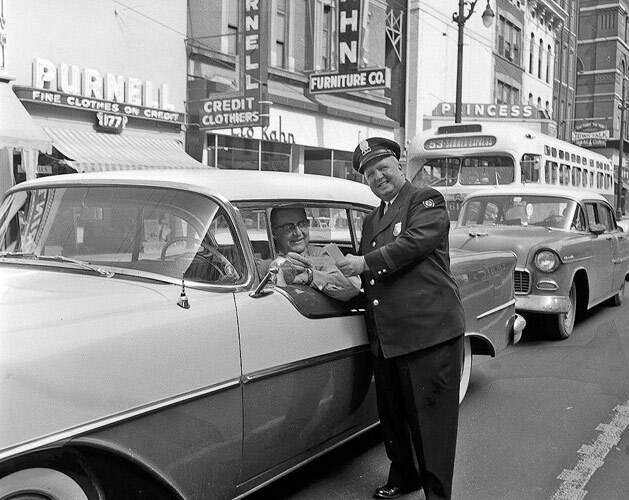 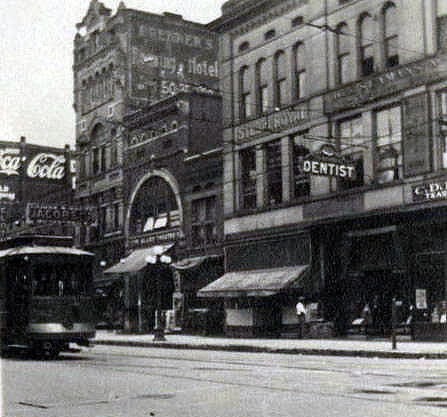 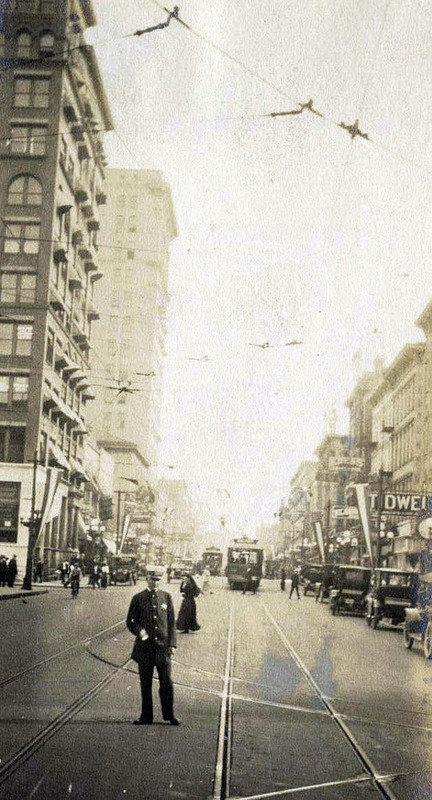 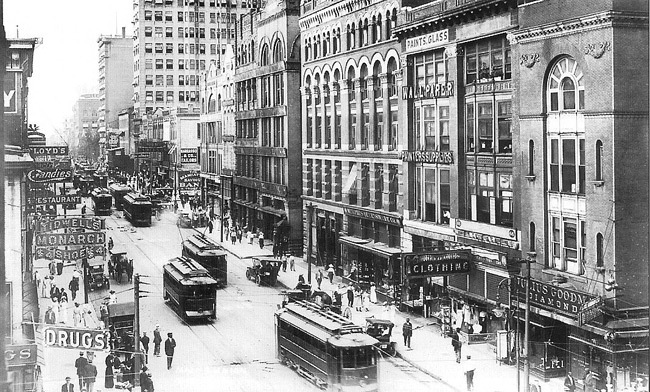 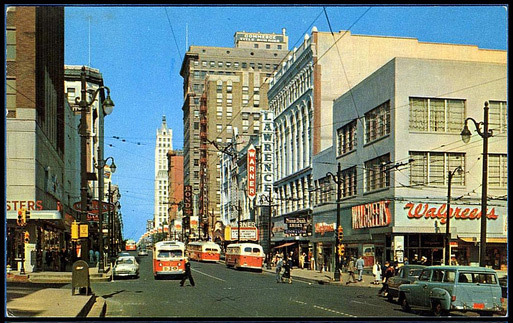 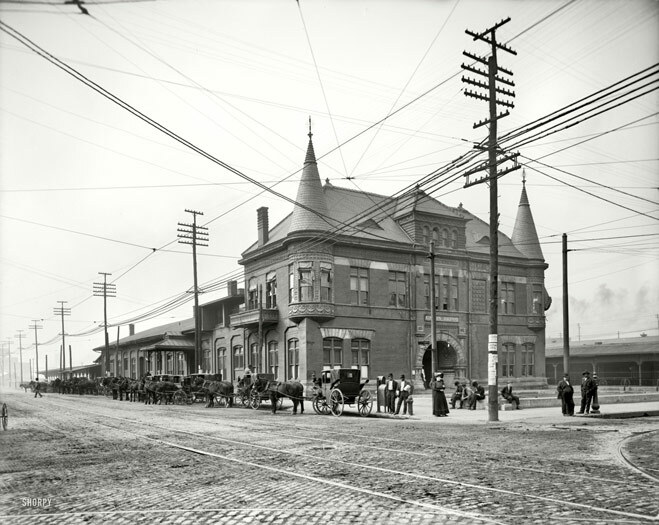 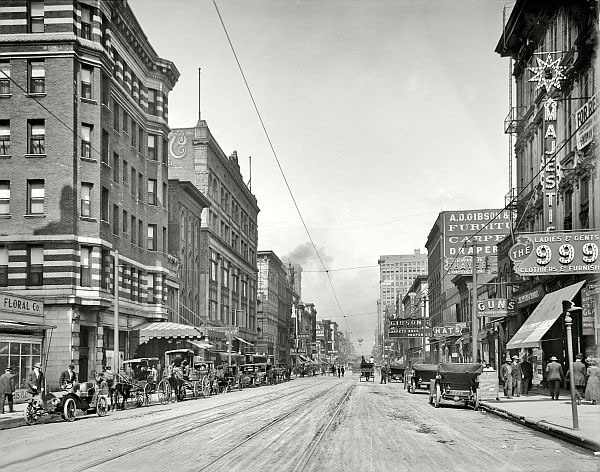 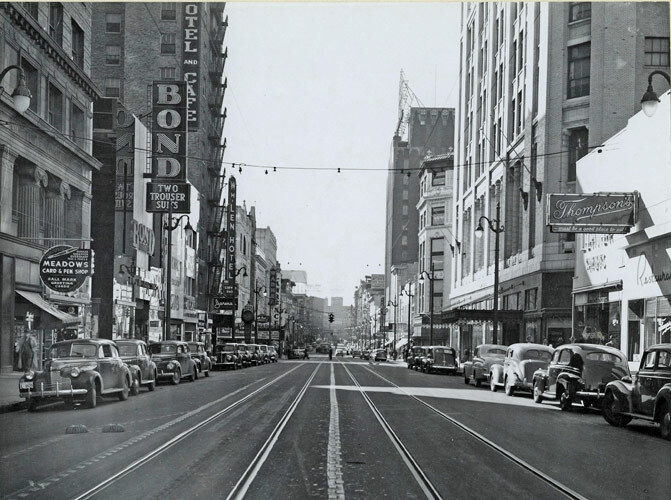 Suburban flight took a major toll on downtown Memphis and most businesses began deserting Main Street. 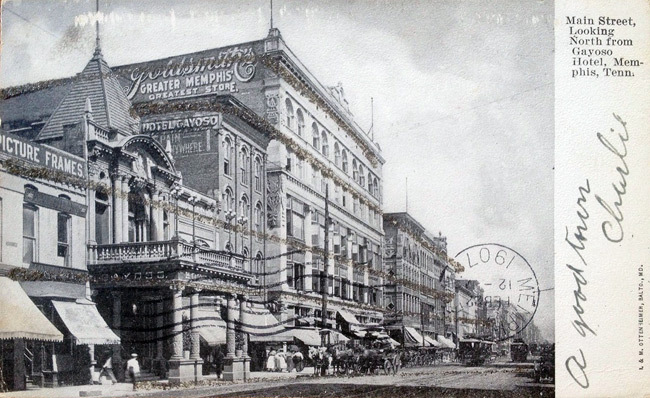 Soon the grand shops, hotels, and theatres closed and boarded up their windows. 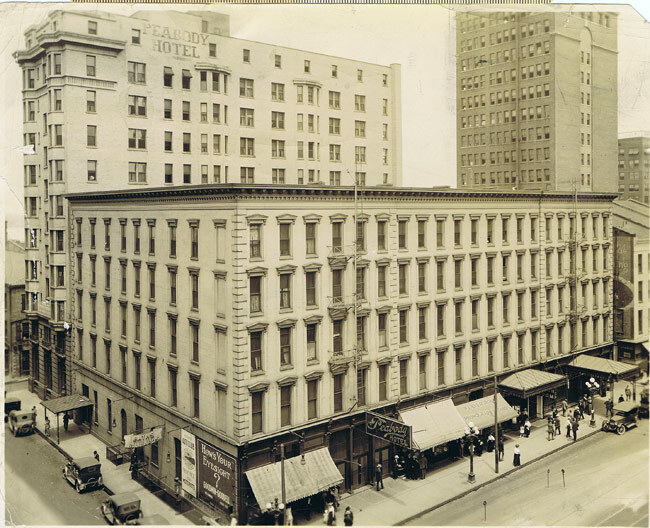 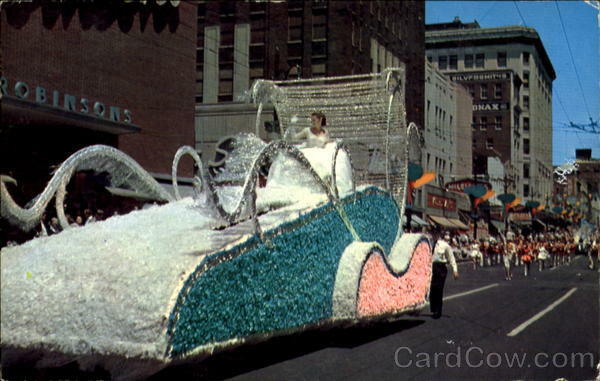 Even the famous Peabody Hotel closed and was sold. 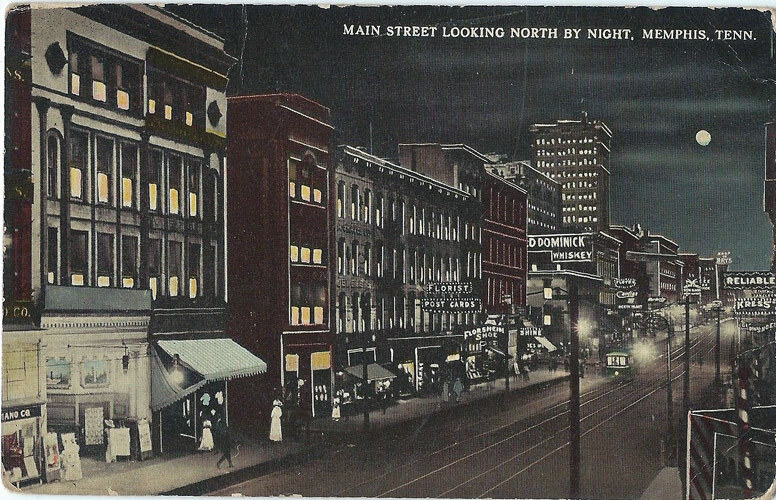 Main Street became a virtual ghost town where no one wanted to be seen. 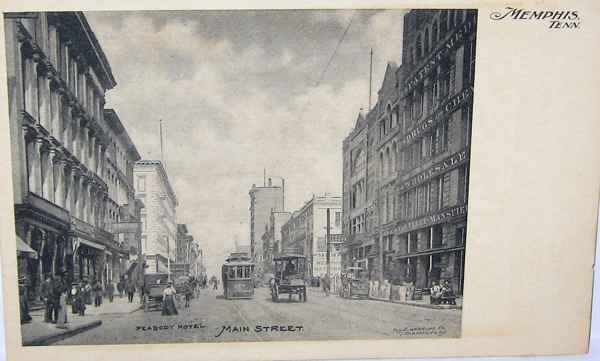 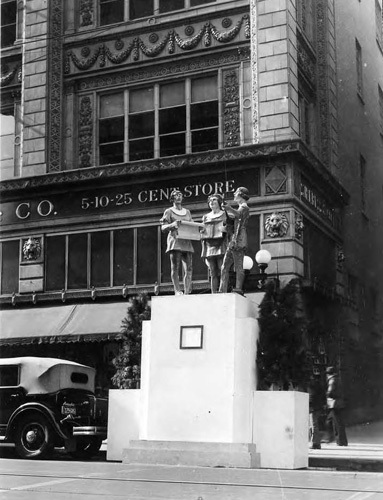 To lure shoppers back to the city, Main Street was converted into a pedestrian mall between Poplar Avenue and Peabody Place. 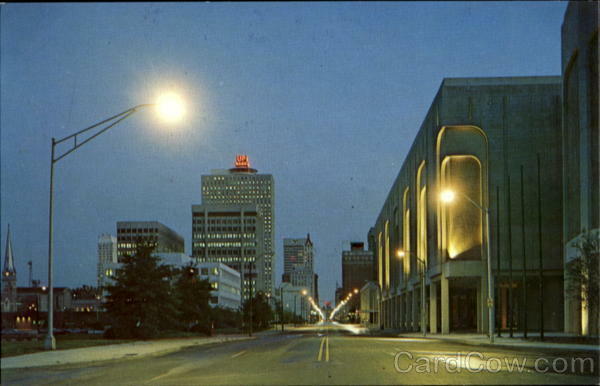 Named "Mid-America Mall", it was inaugurated in 1976 with great fanfare by President Gerald Ford. 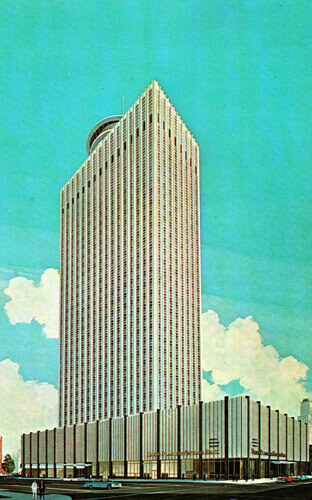 It was not successful. 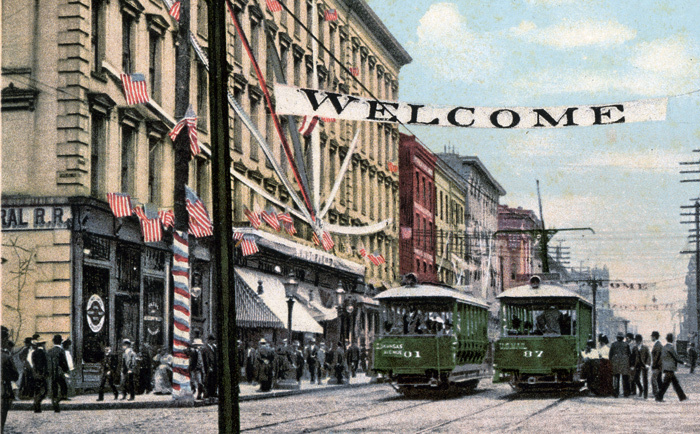 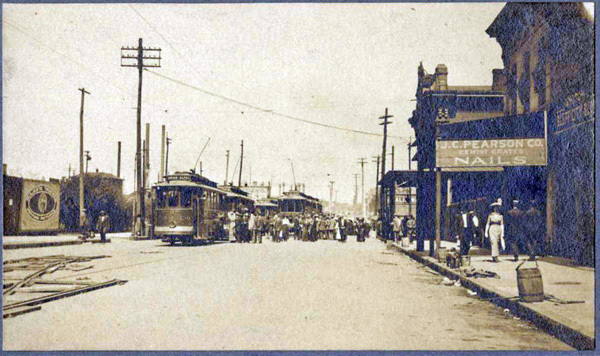 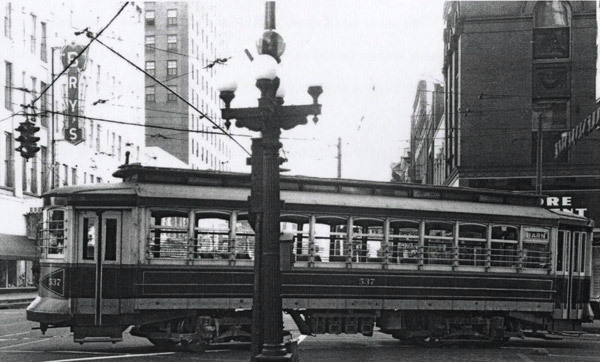 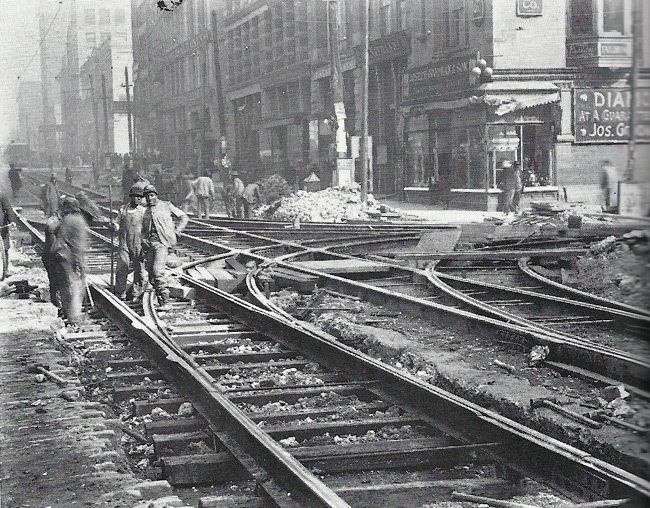 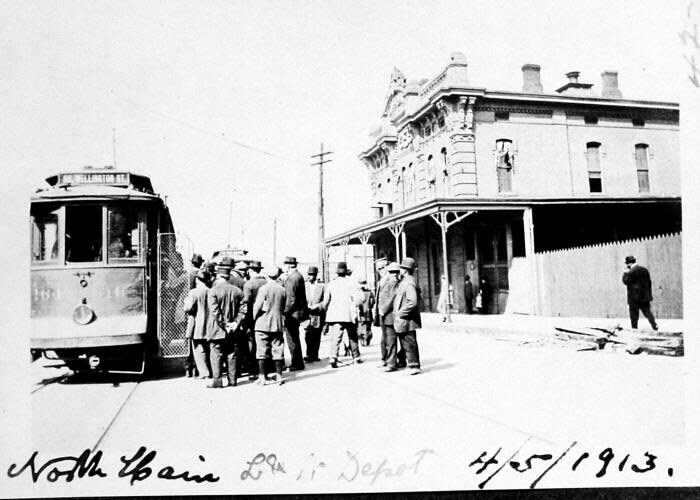 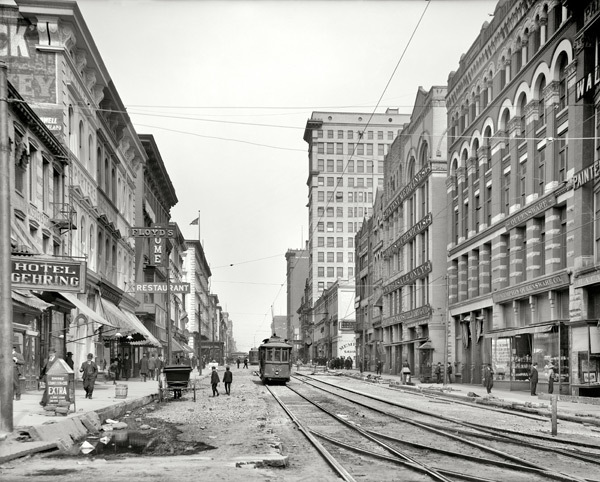 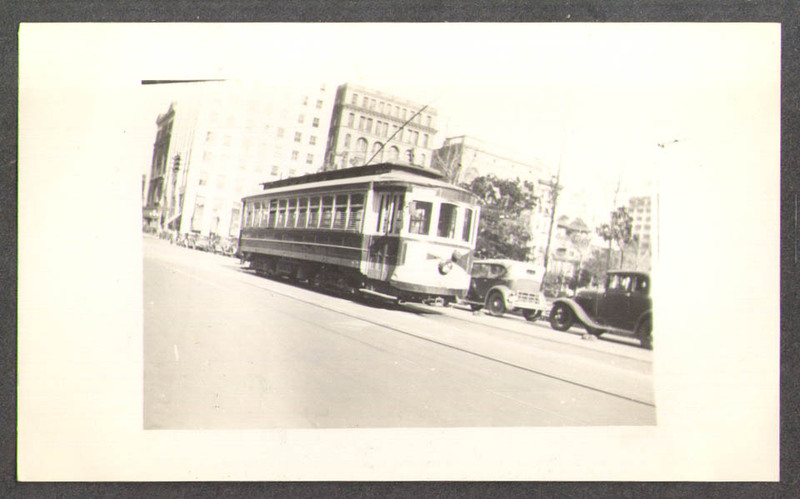 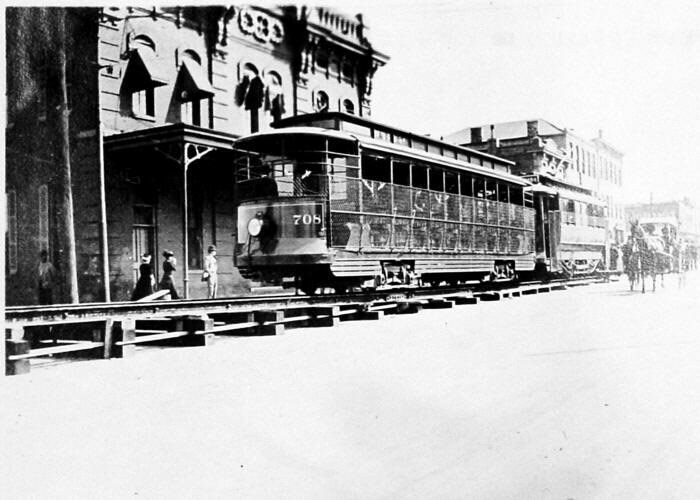 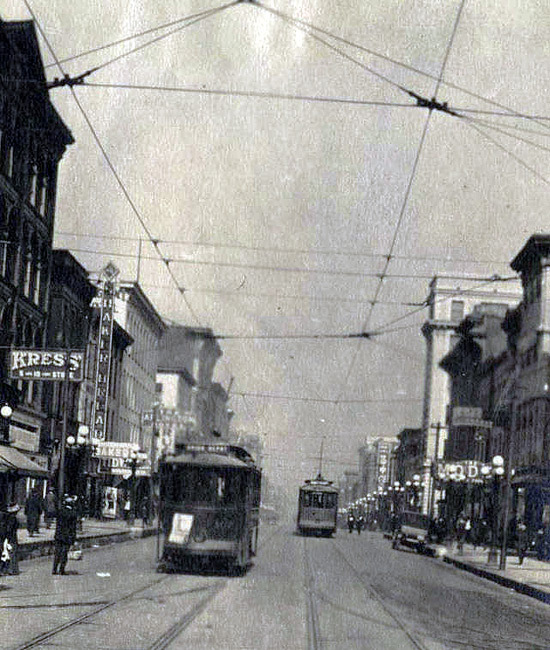 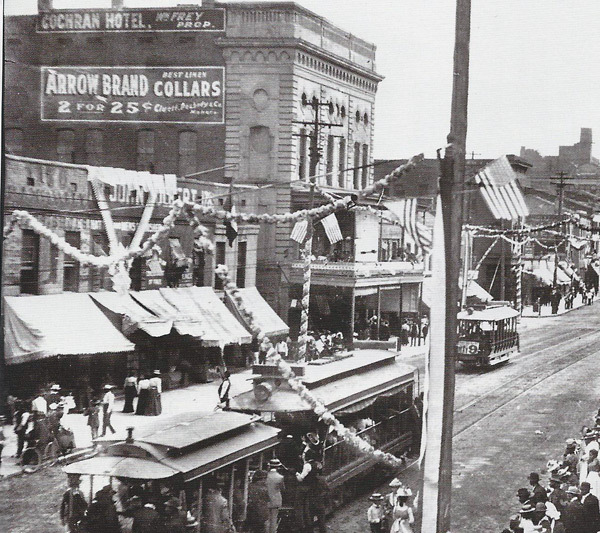 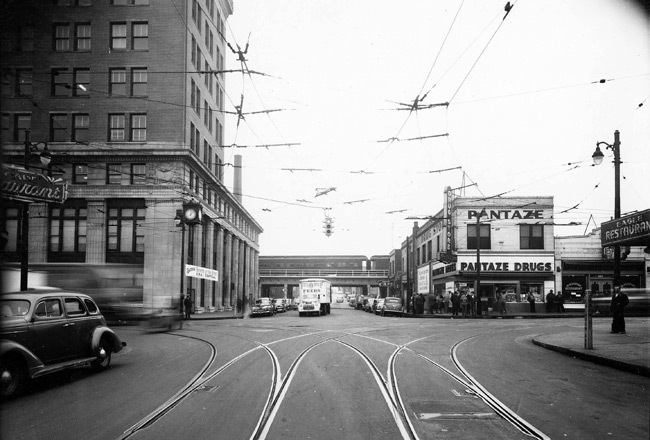 The trolley system, a mainstay of downtown transportation, was reinstated in 1993. 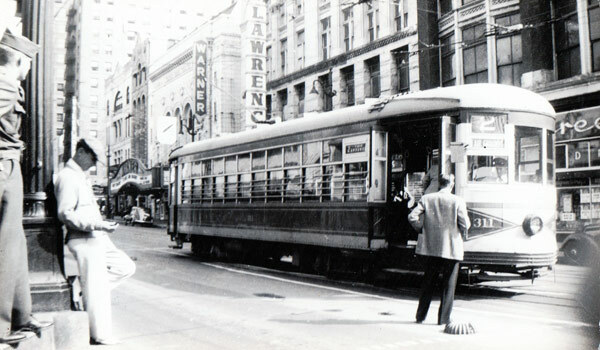 The vintage trolleys were purchased mostly from Melbourne and Lisbon - two cities noted for their trolleys. 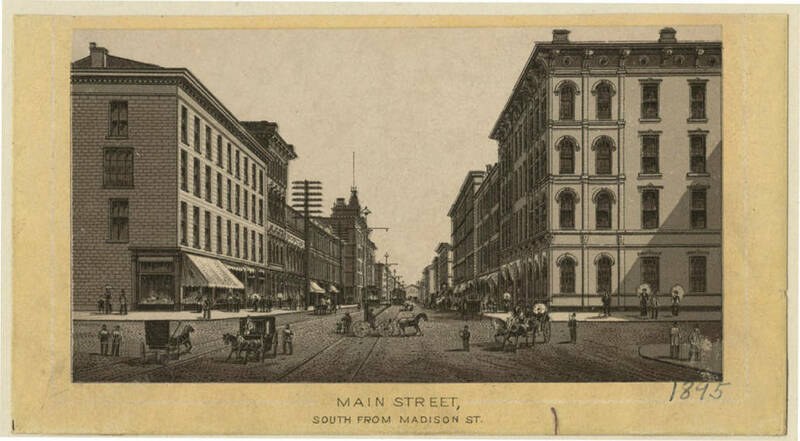 It has taken time, but Main Street is slowly beginning to become the busy street it once was. 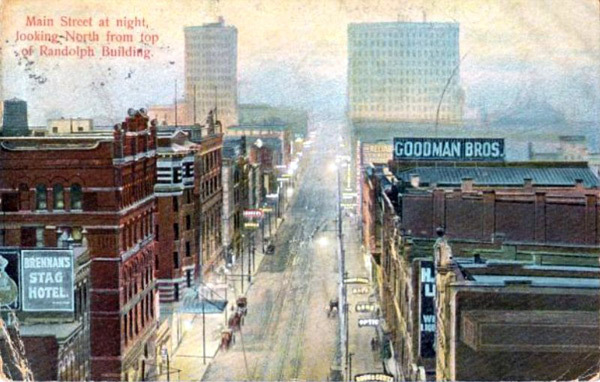 Now, new restaurants, shops and condos have sprung up in renovated historic buildings and this is indeed revitalizing downtown. 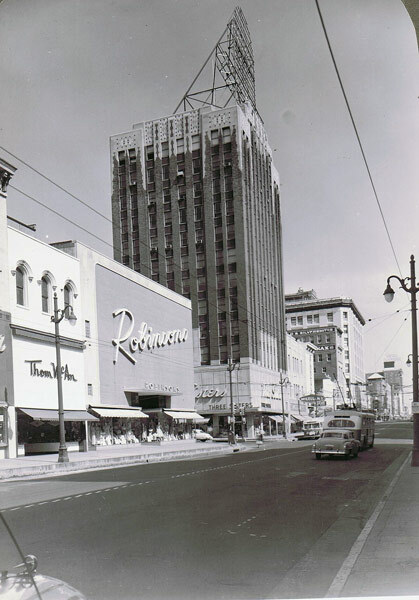 Sadly, this Renaissance was not soon enough to save more of the classic downtown architecture. 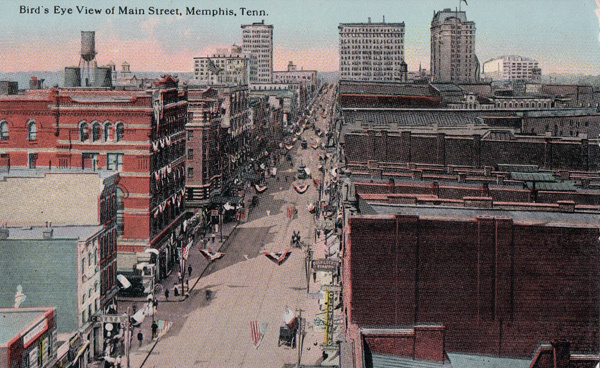 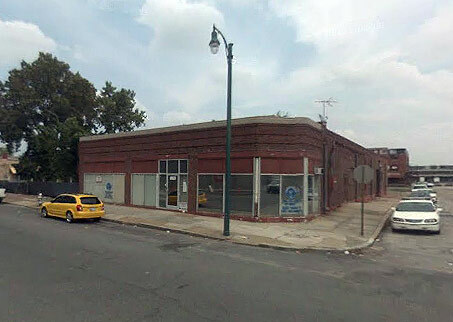 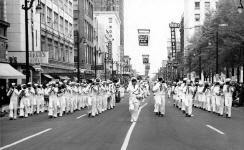 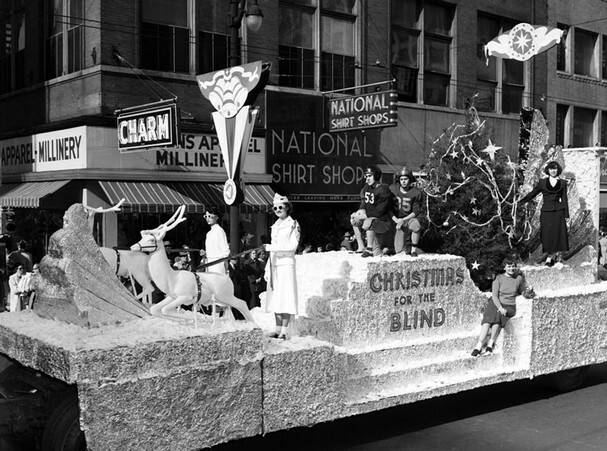 In 1982 the Memphis Main Historic District was placed on the National Register of Historic Places. 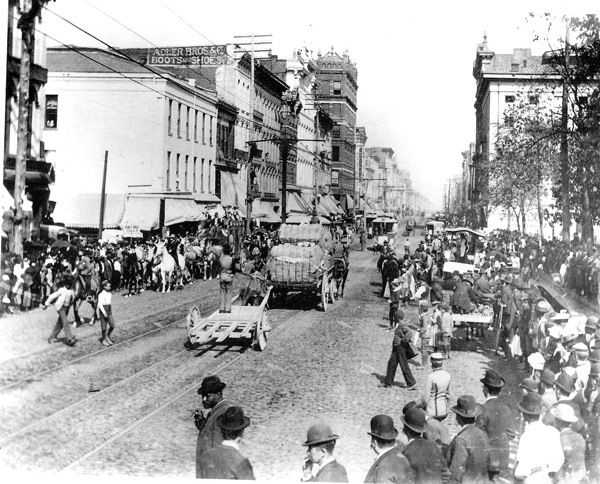 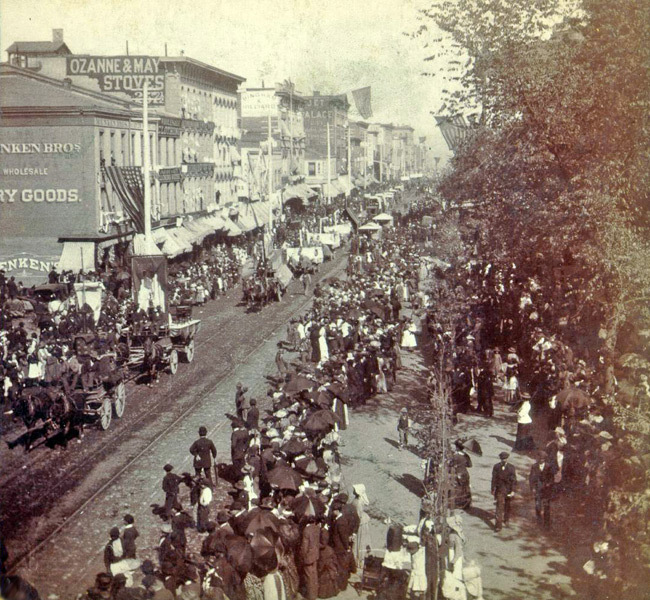 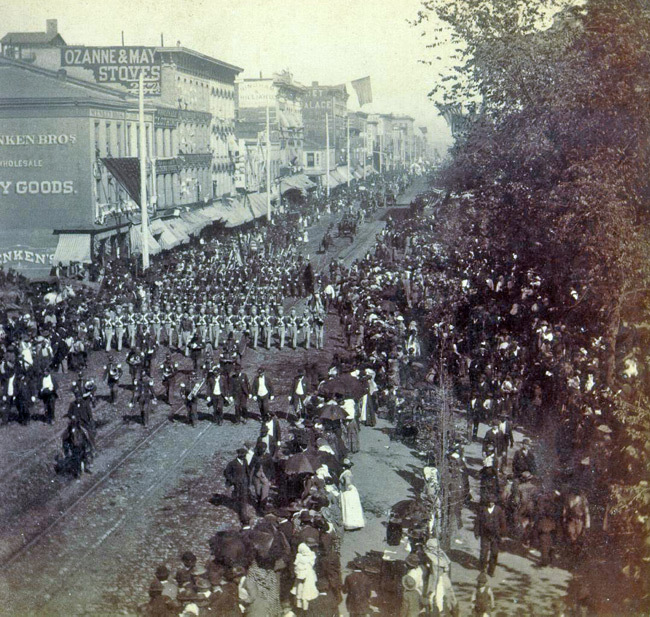 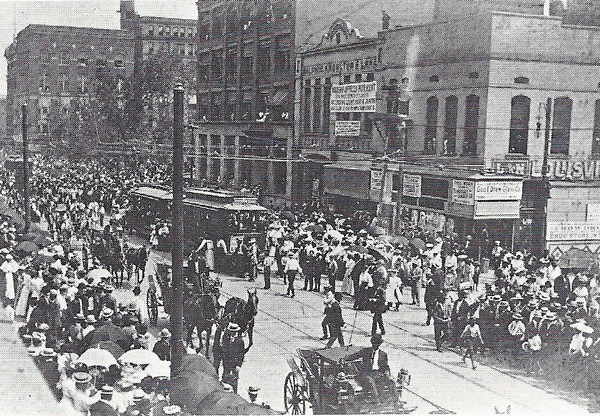 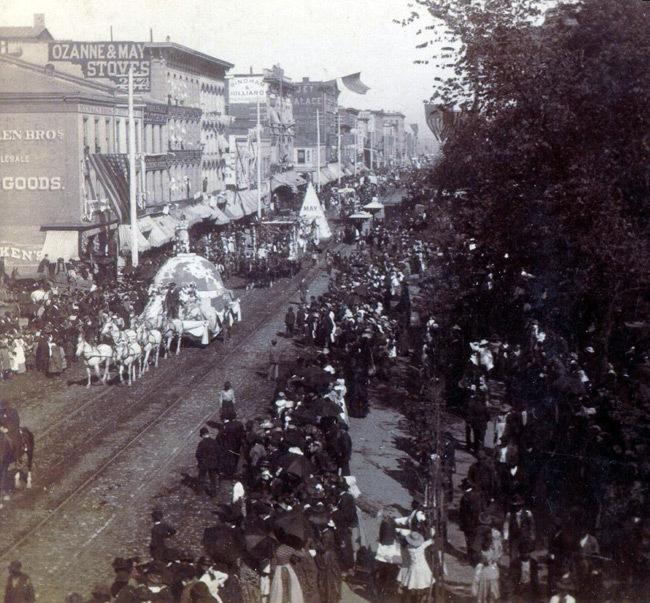 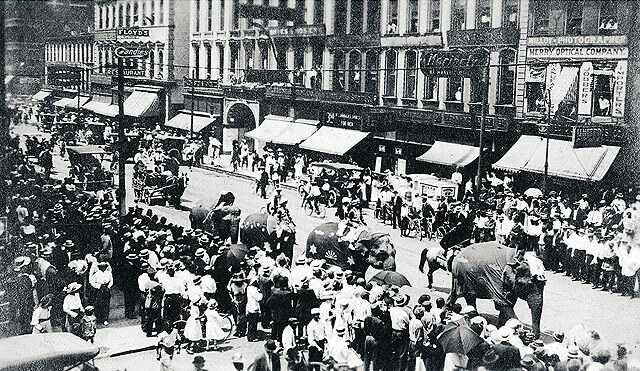 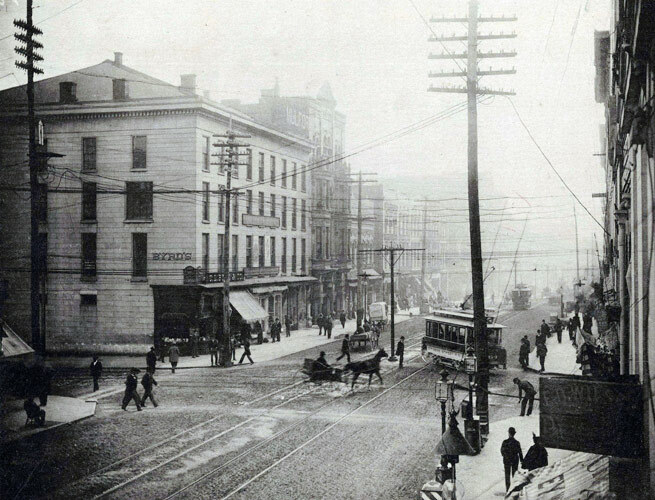 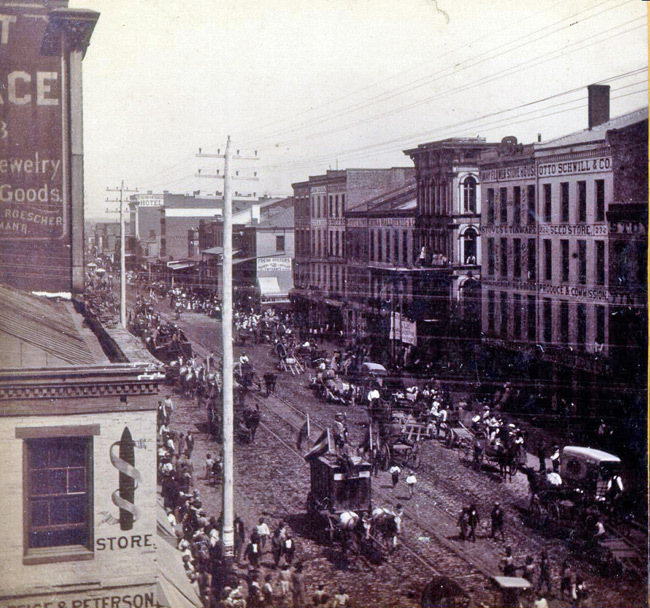 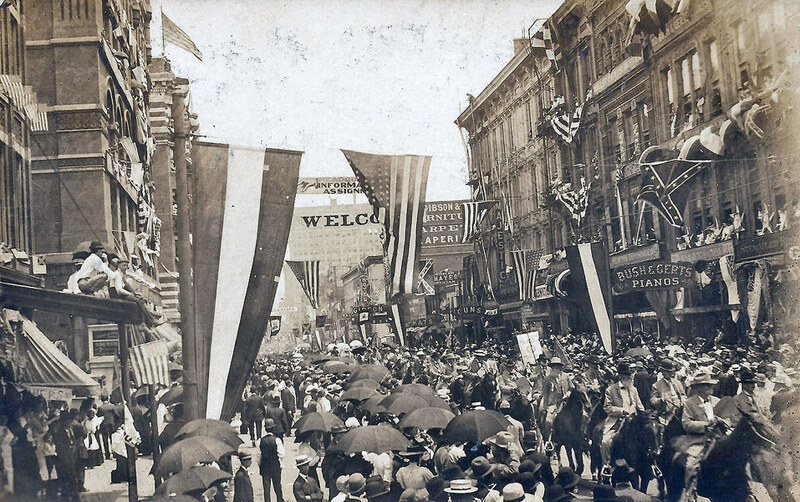 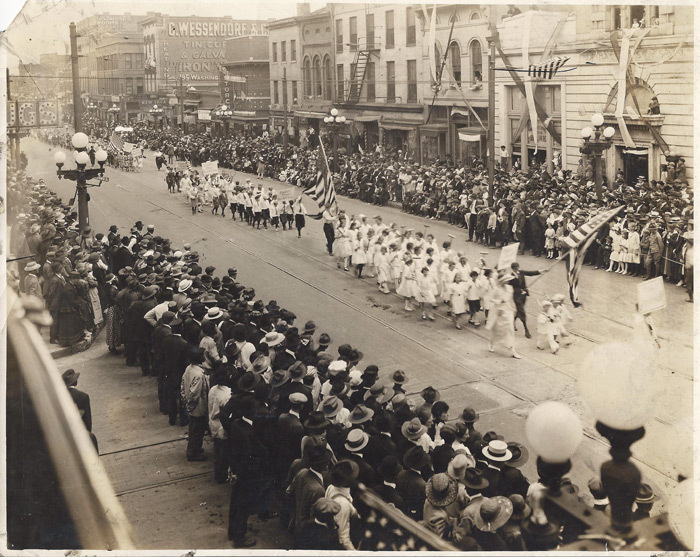 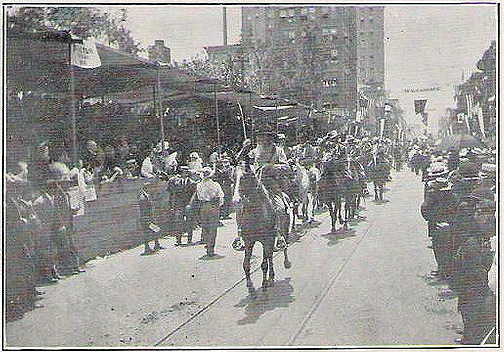 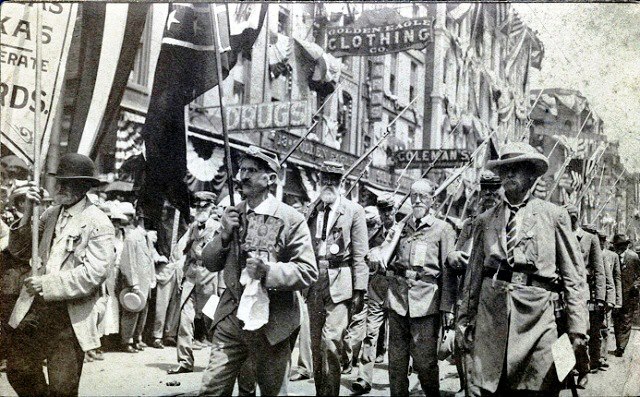 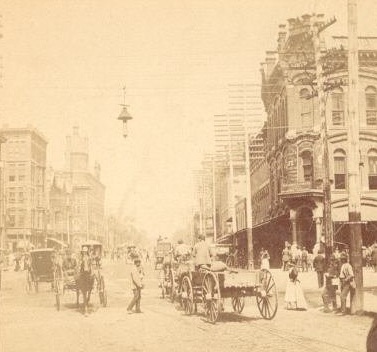 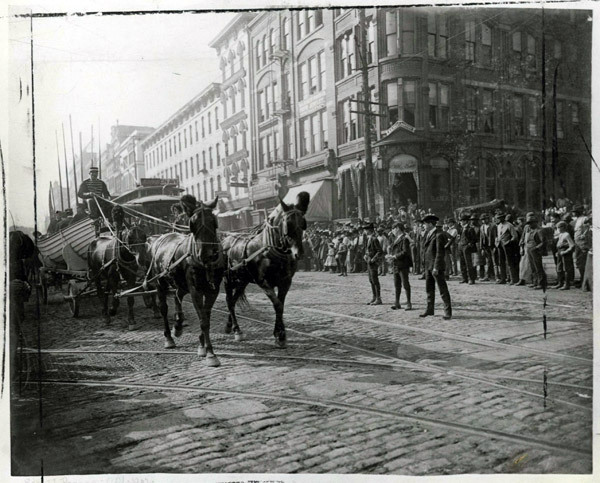 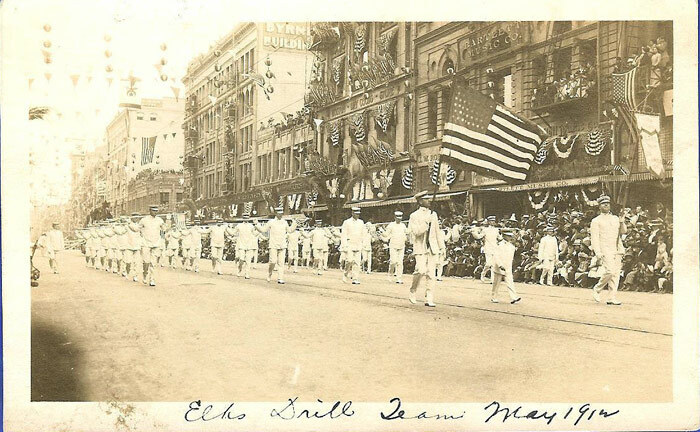 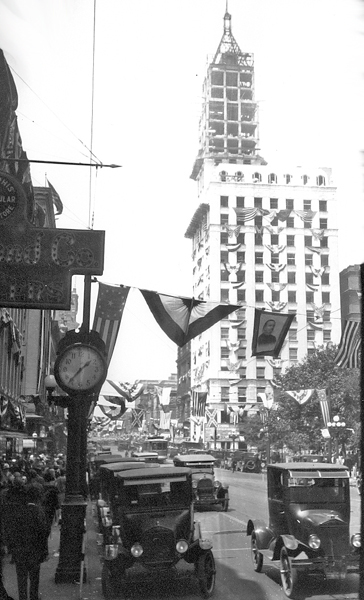 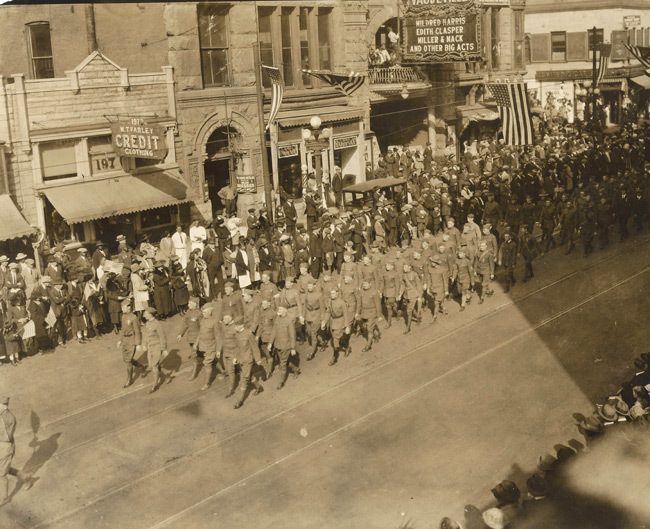 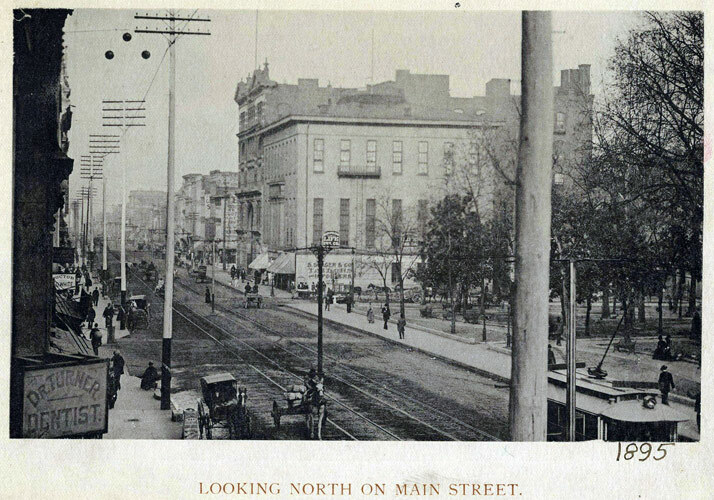 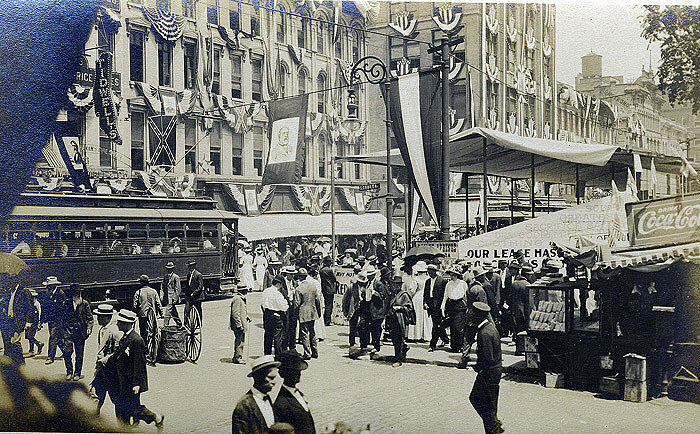 1883: These 4 rare photos depict a parade down Main Street at Court Square. 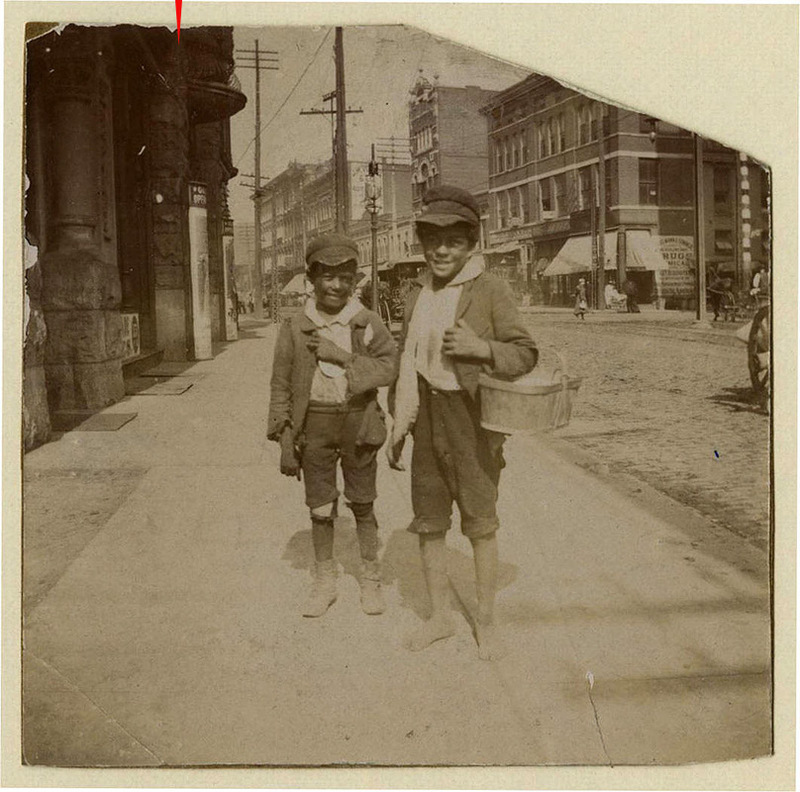 These three very rare circa 1902 photos (below) were discovered on eBay in 2013. 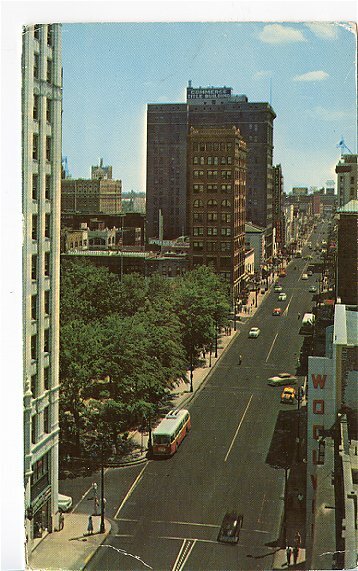 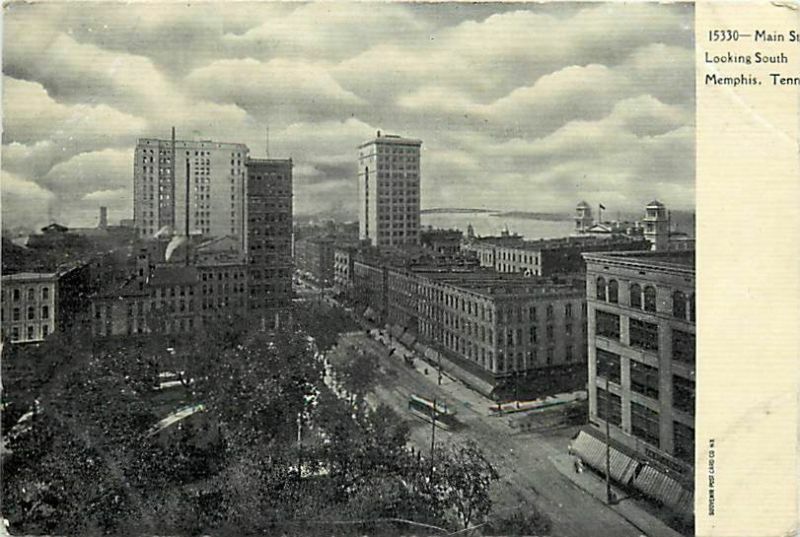 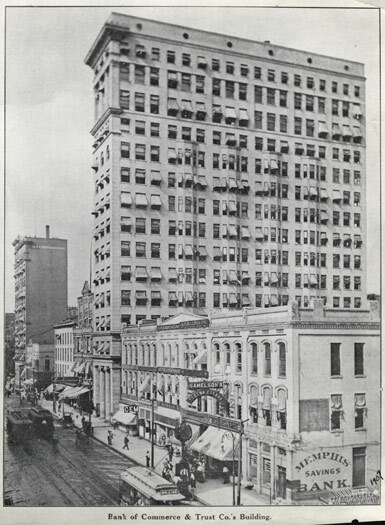 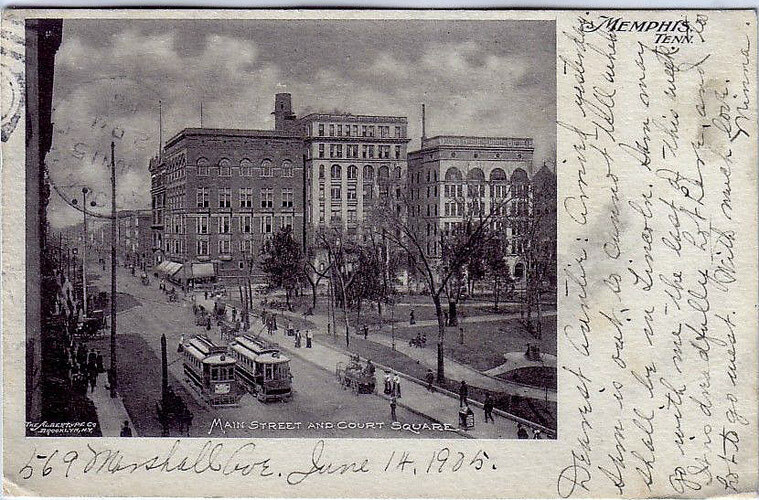 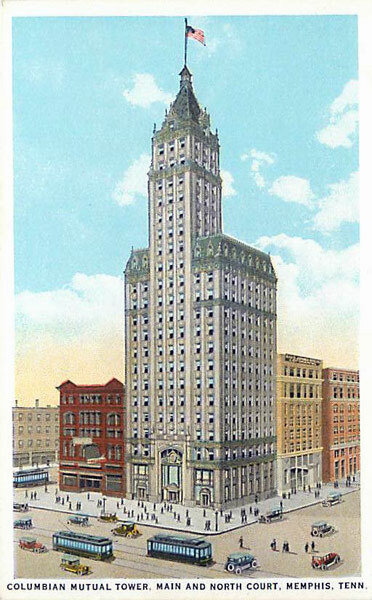 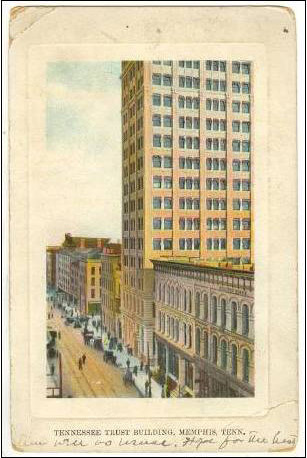 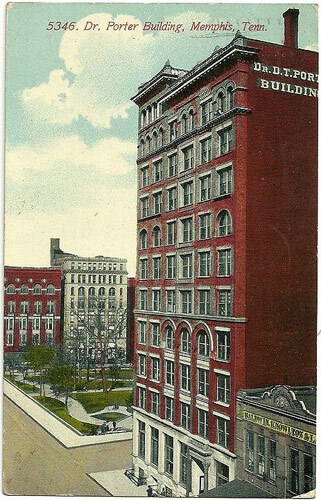 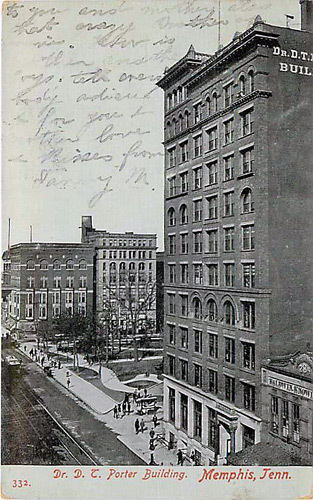 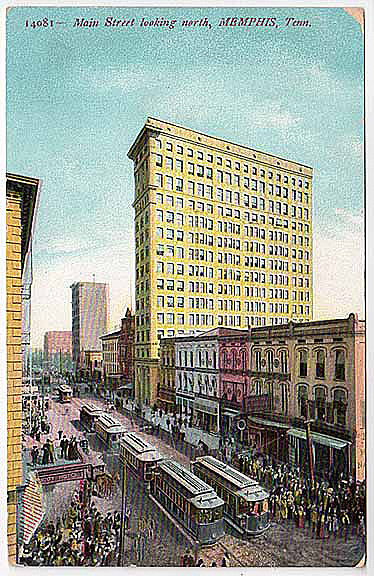 The buildings are at the corner of Main and St. Paul, directly across from Central Station. 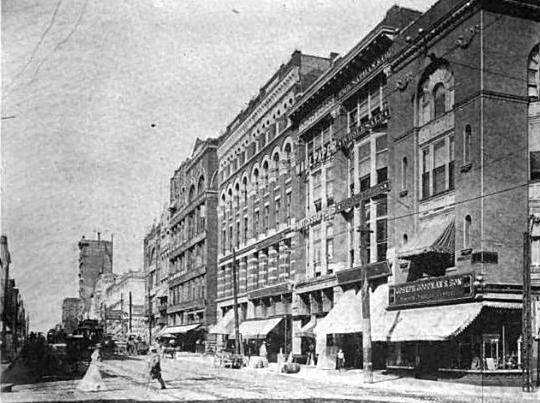 A row of similar one story buildings still exists on this corner. 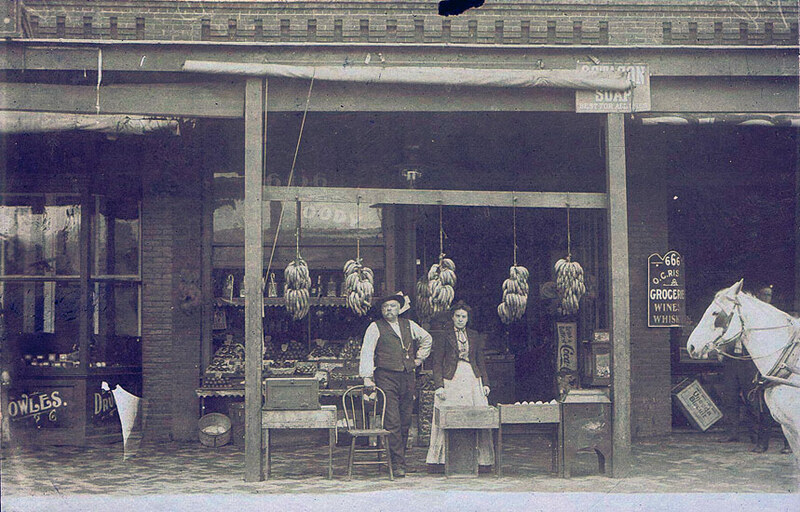 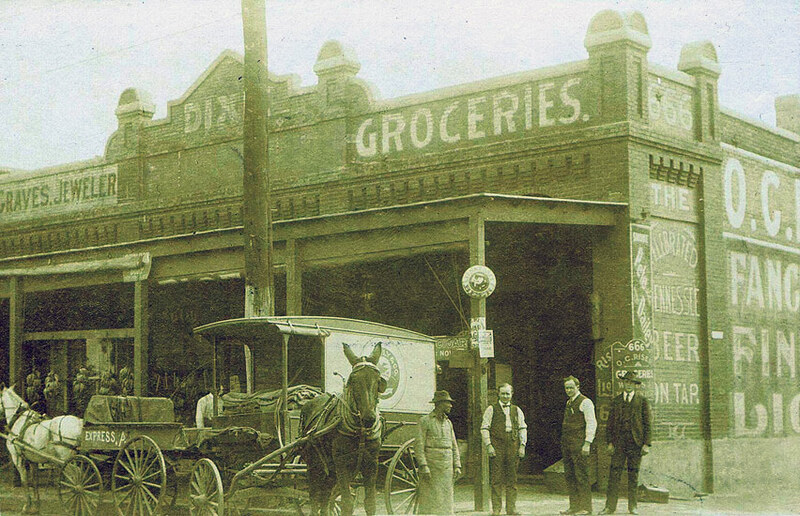 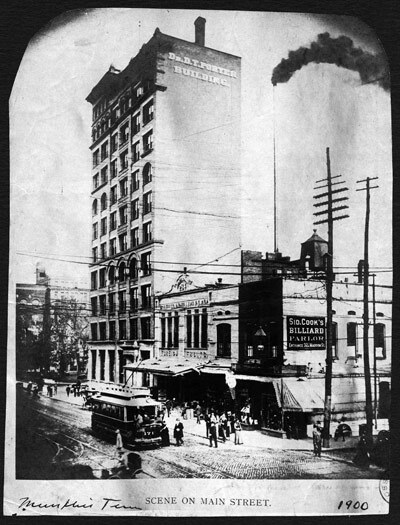 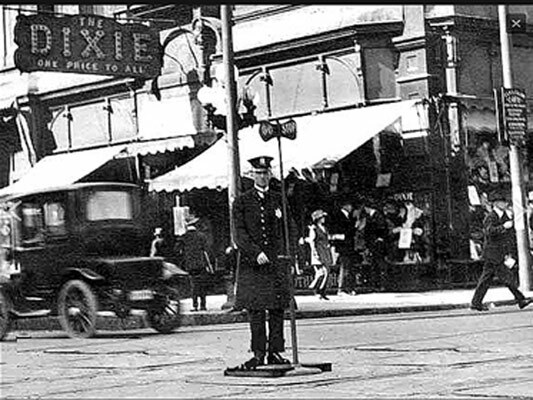 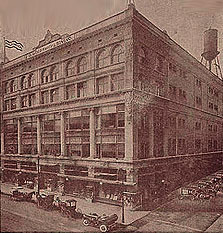 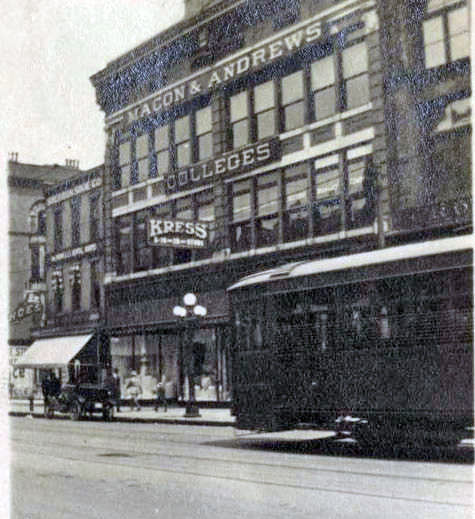 Riser's Grocery is listed in the 1902 Directory at 664 Main and that number is on two of the photos (By 1920 that number was changed to 570 S. Main). 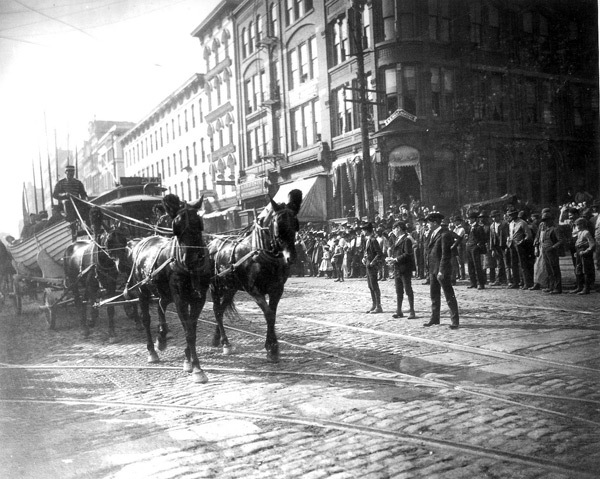 Notice on one of the horse-buggies in front that they have "Express" delivery. 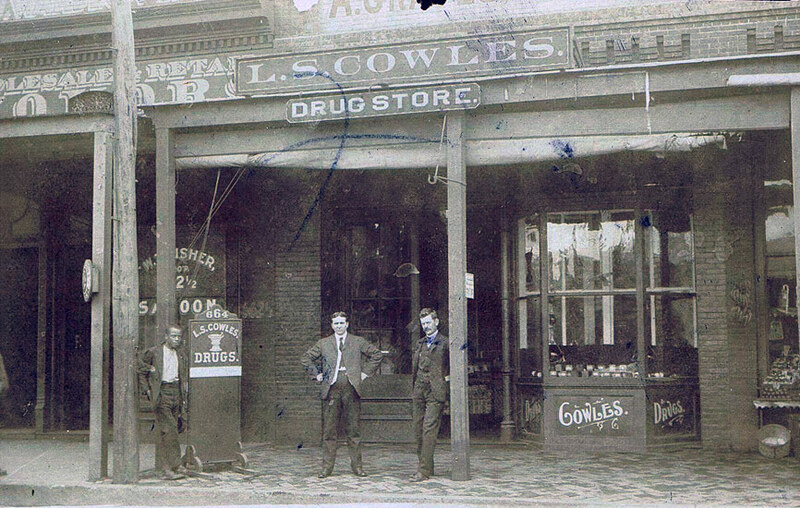 L. S. Cowles Drug Store is listed in the 1902 Directory at 664 Main, which places it next door. 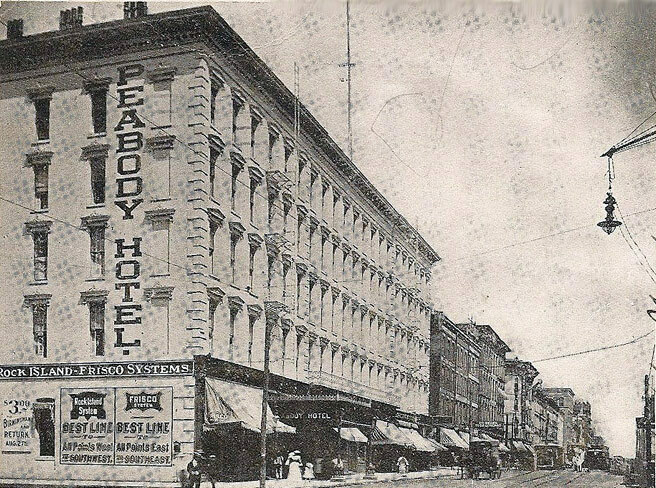 There is a third building partially showing, which is a Saloon. 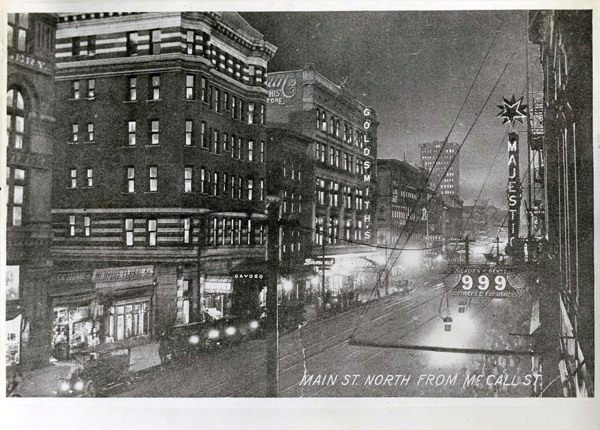 The address appears to be 662 1/2. 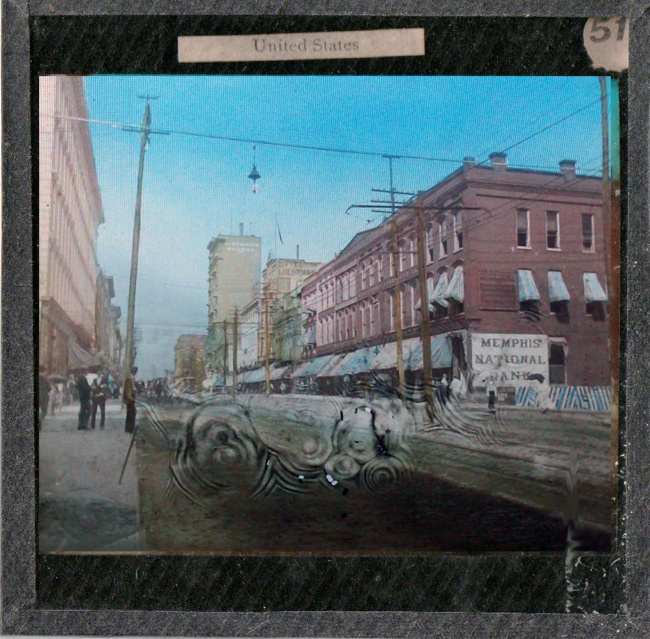 All three photos were taken minutes apart, for the owner of the property John and Barbara Spang, whose names are on the back of the photos. 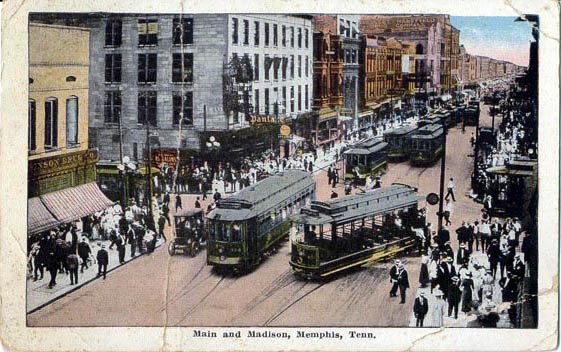 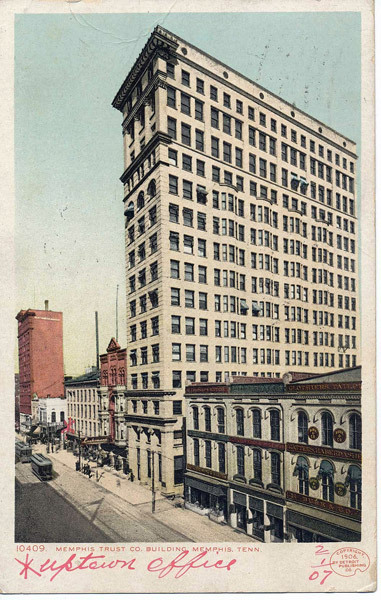 They are also listed in the 1902 Memphis Directory. 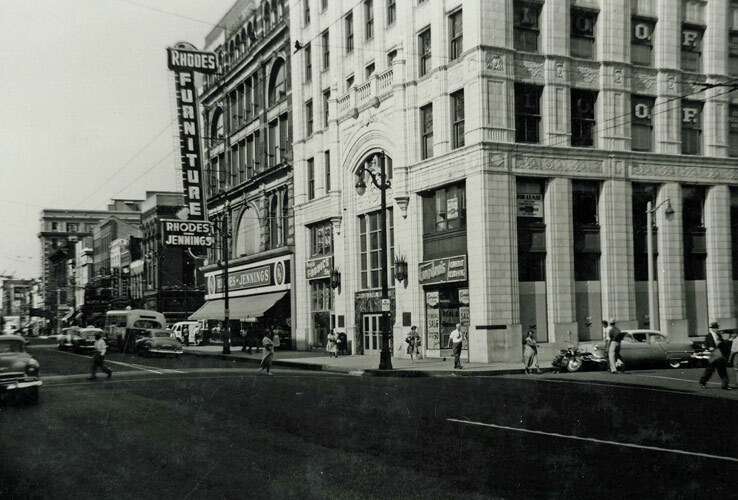 VINTAGE PHOTOS Can anyone help determine the year or decade?